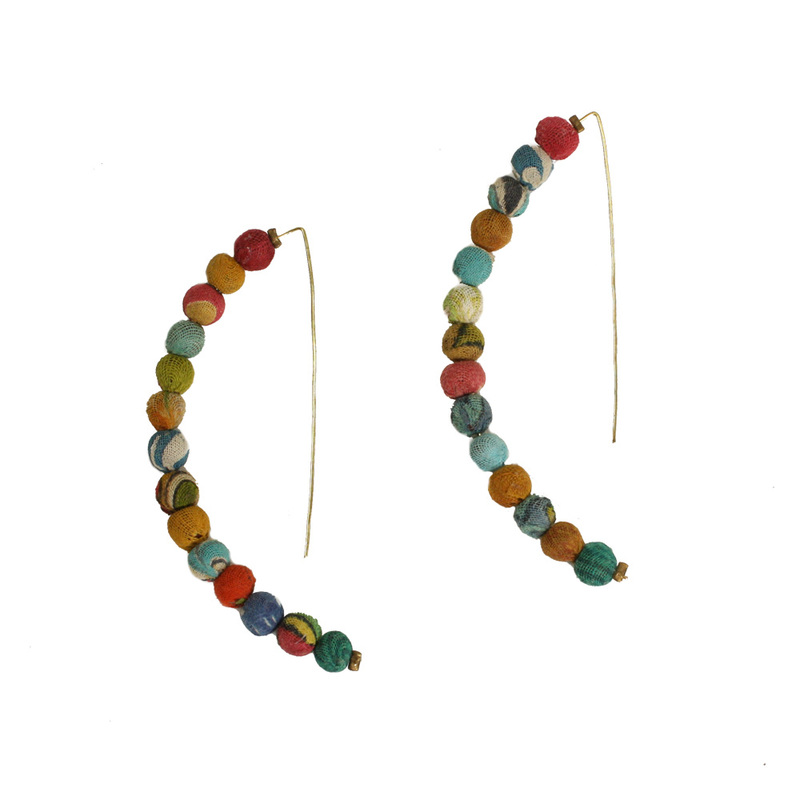 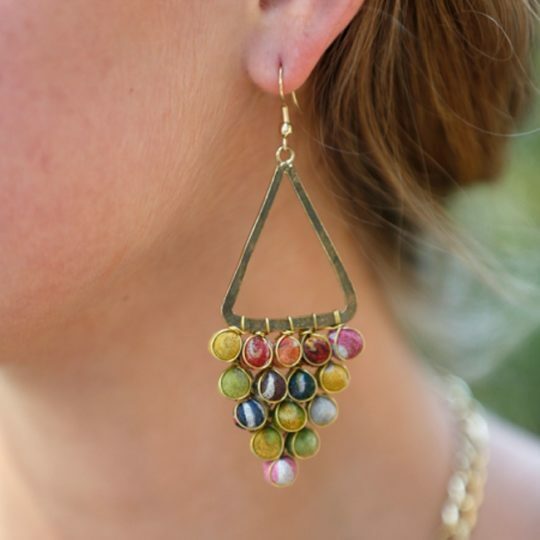 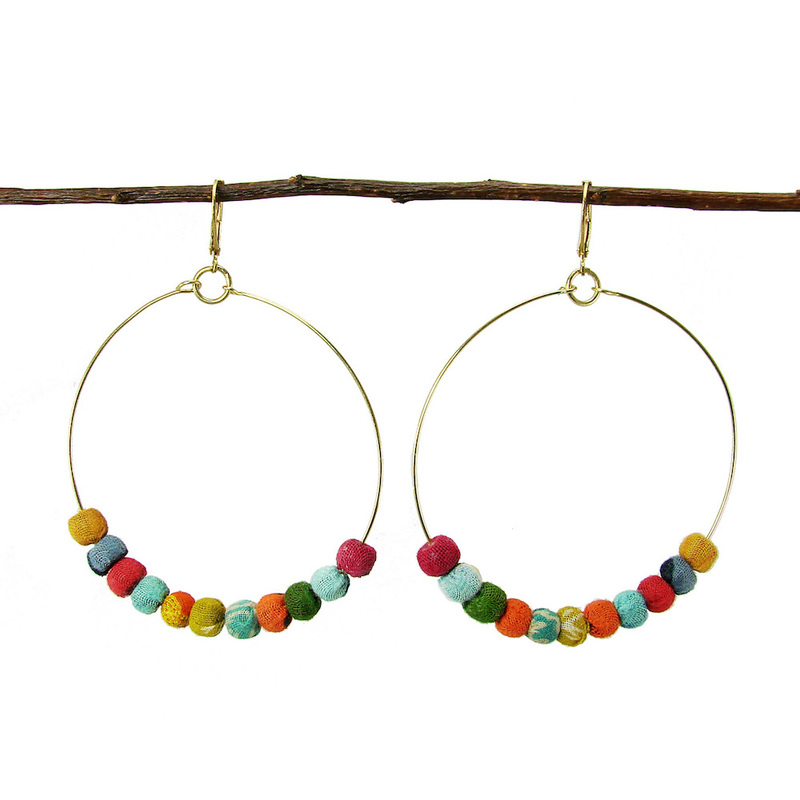 Horseshoe shaped earrings with beaded wire fringe in rainbow colors. 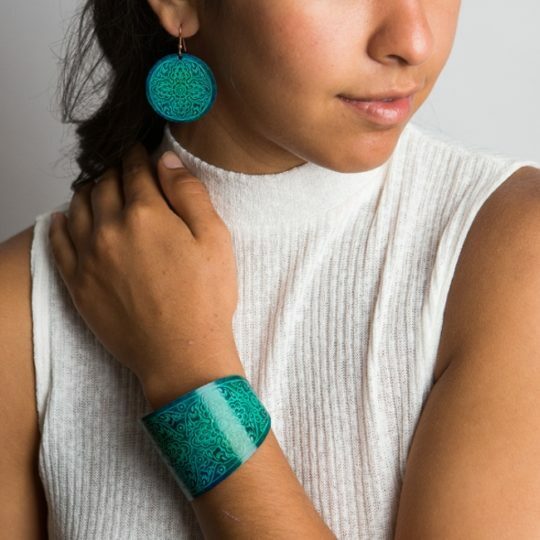 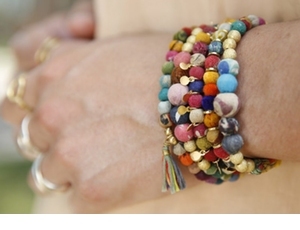 Handmade by artisans in Guatemala. 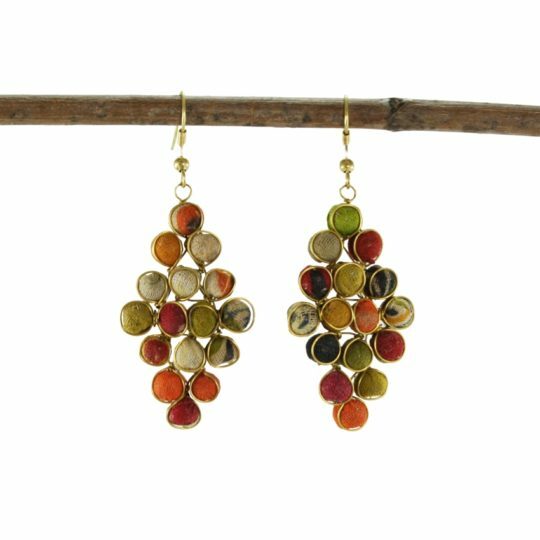 Material: Czech & Japanese glass seed beads and crystals, wire, Surgical steel ear wires Size: Dangles 2-1/4"
Classic teardrop earrings featuring rows of rainbow glass beads. 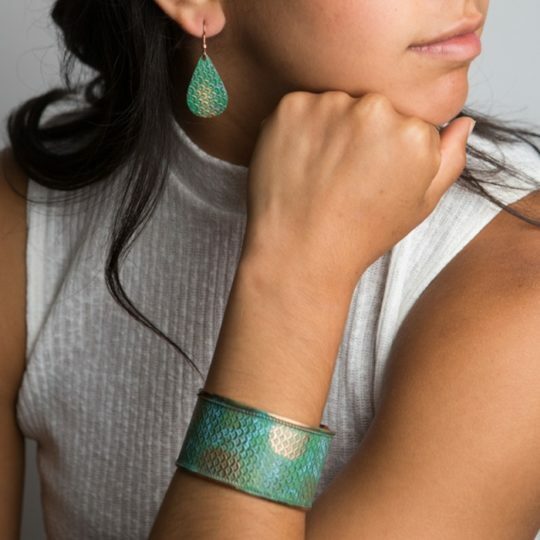 Handmade by artisans in Guatemala. 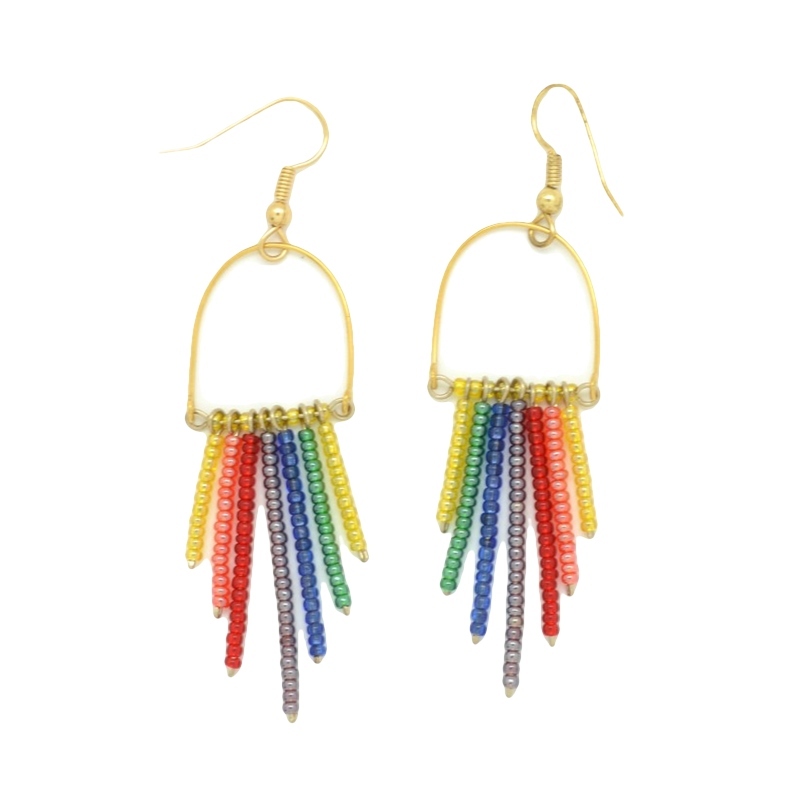 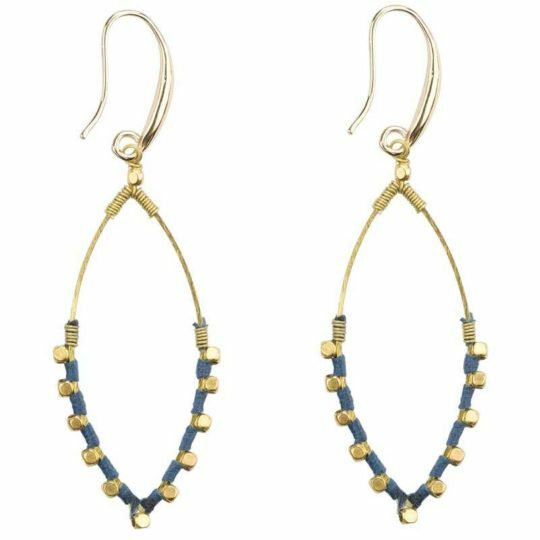 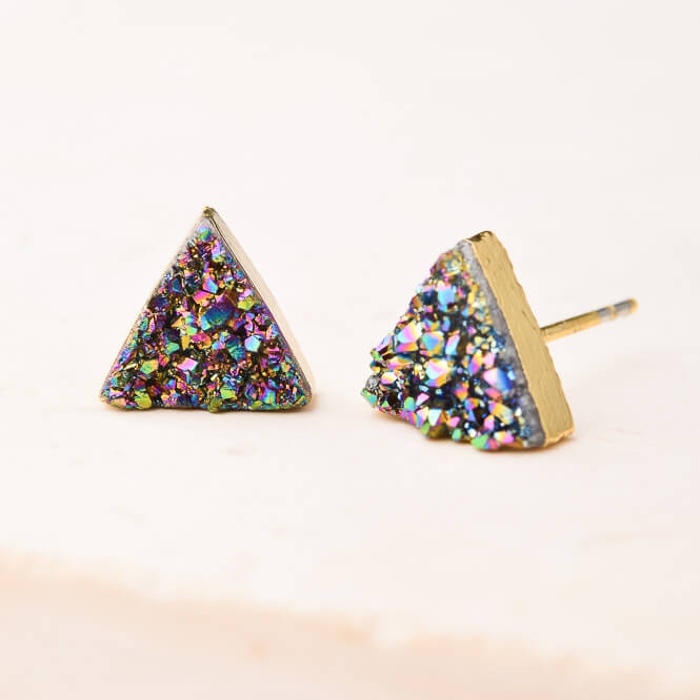 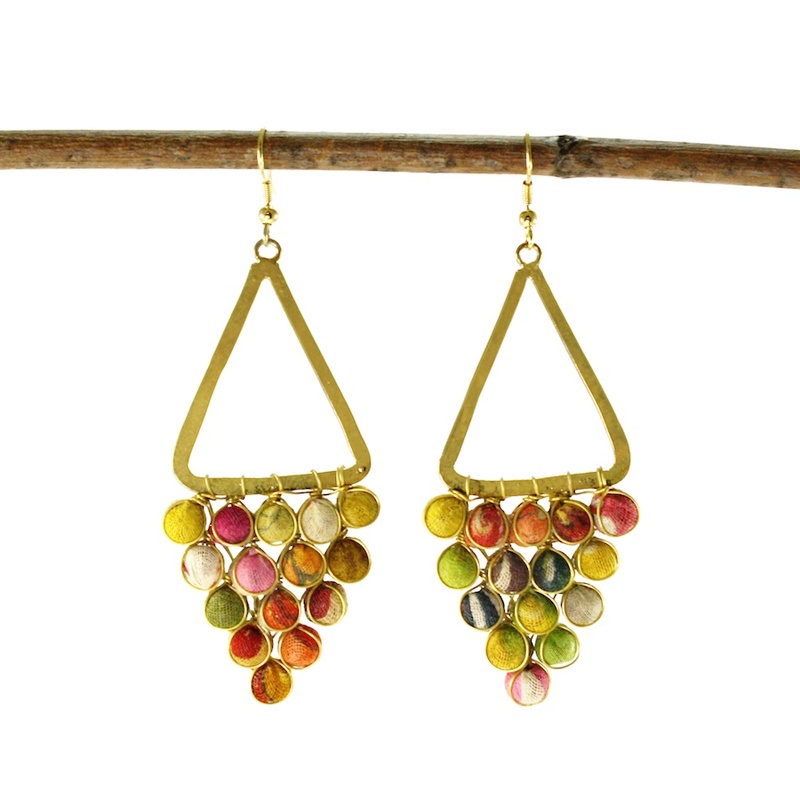 Material: Czech & Japanese glass seed beads and crystals, wire, Surgical steel ear wires Size: Dangles 1-1/8"
These sweet little diamond-shaped earrings feature an arching rainbow of tiny beads and a dangling crystal. 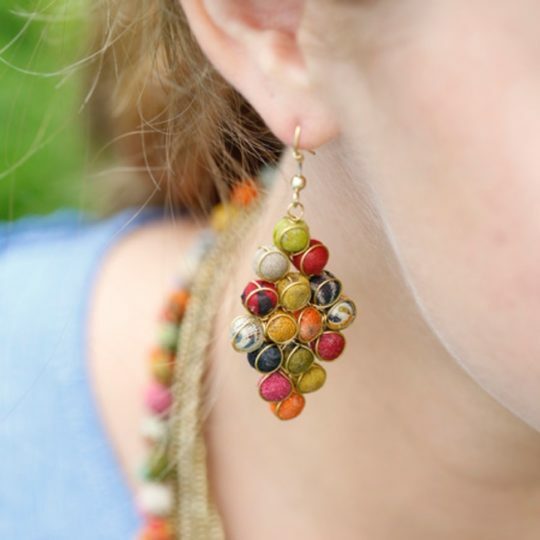 Handmade by artisans in Guatemala. 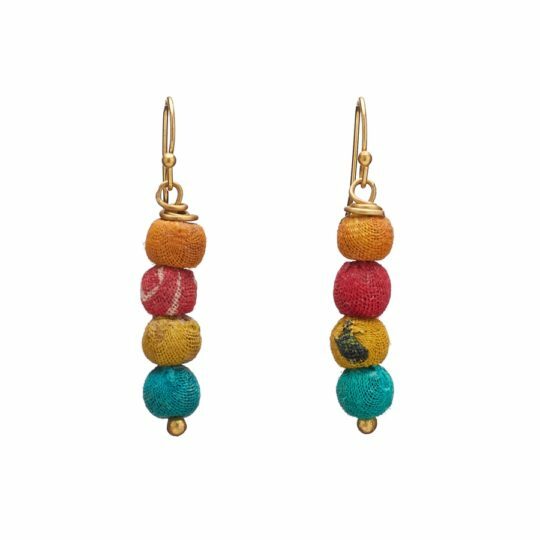 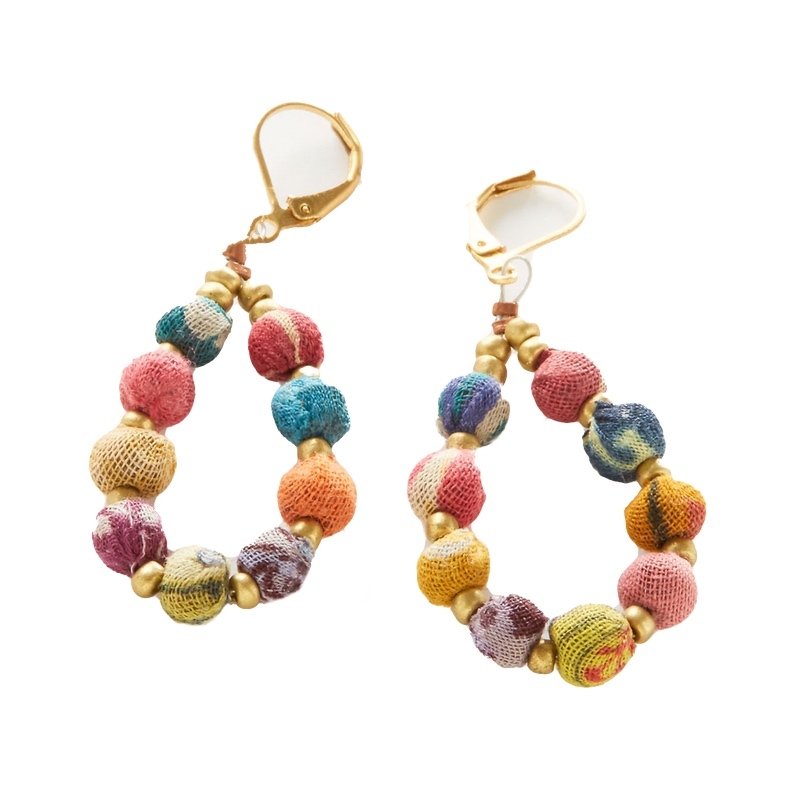 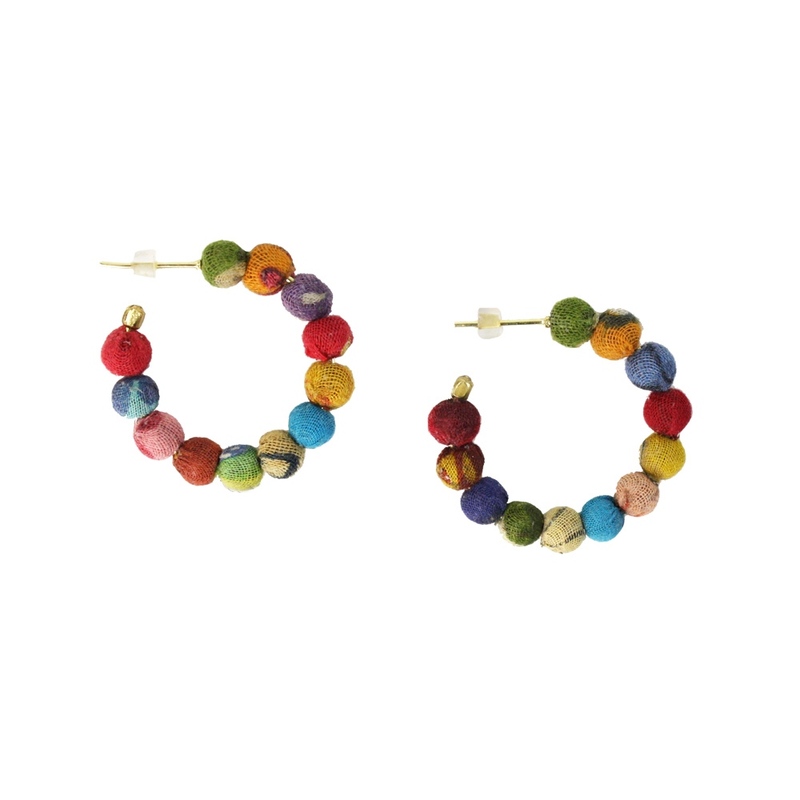 Material: Czech & Japanese glass beads, wire, Surgical steel ear wires Size: Dangles 1-1/8"
These small rainbow earrings feature a web of wire and seed beads like a crocheted dream catcher. 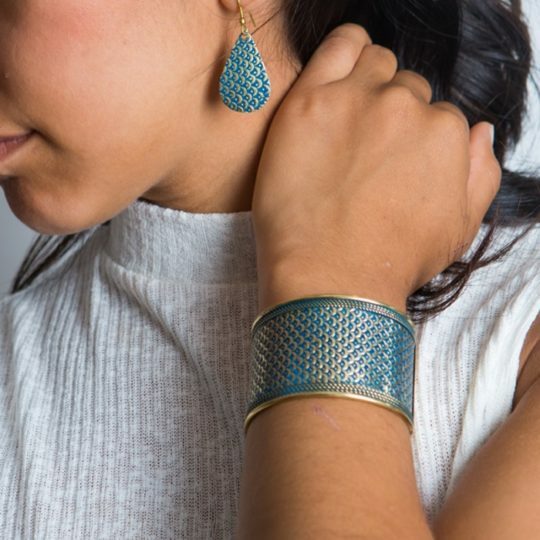 Handmade by artisans in Guatemala. 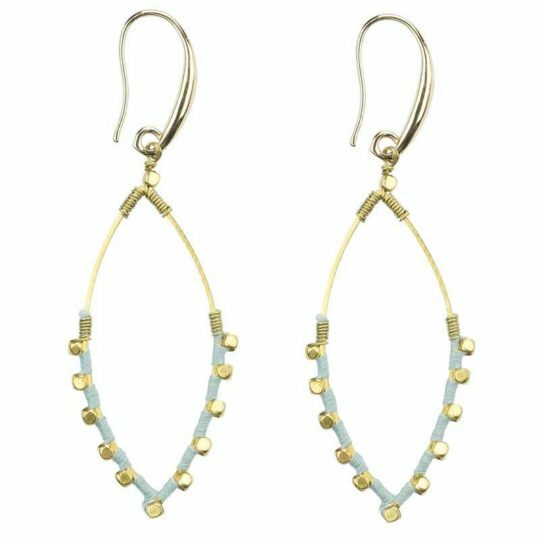 Material: Czech glass beads, wire, Surgical steel ear wires Size: Dangles 1-1/8", Width 5/8"
Handcrafted 'water goddess' chain drop earrings feature teal patina fin charms with gold finish teardrop overlay. 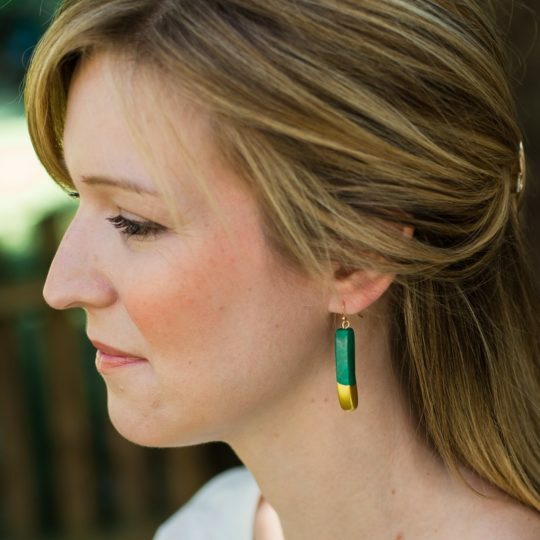 Size: 2.25" L, 2" W Material: Brass, Gold and teal patina finish **Learn more about Matr Boomie and the artisans who made this product. 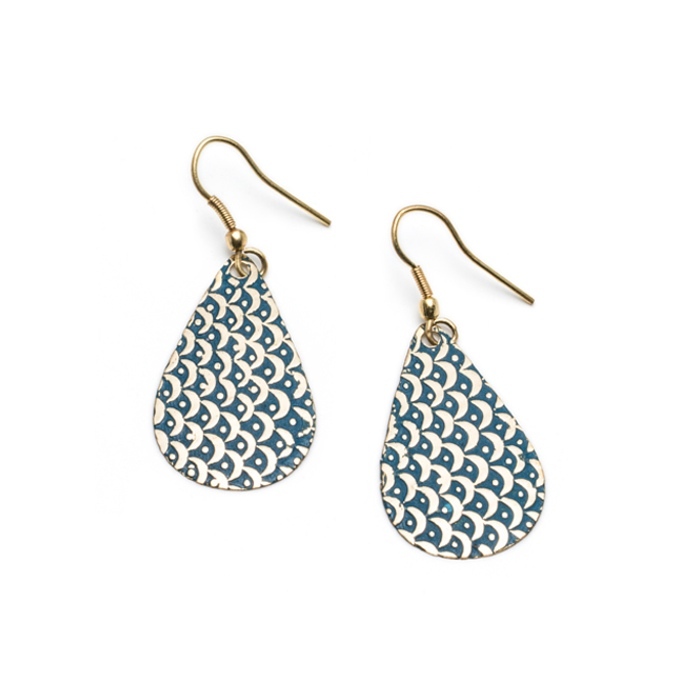 Handcrafted 'sea treasure' drop earrings feature teal patina scallop charms with gold finish filigree overlay. 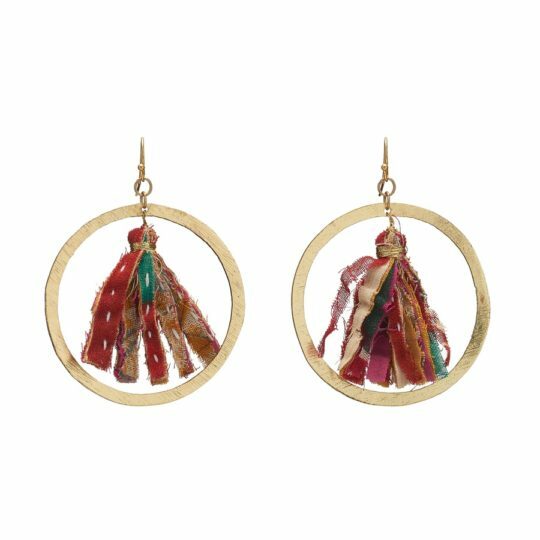 Size: 2.25" L, 1.5" W Material: Brass, Gold and teal patina finish **Learn more about Matr Boomie and the artisans who made this product. 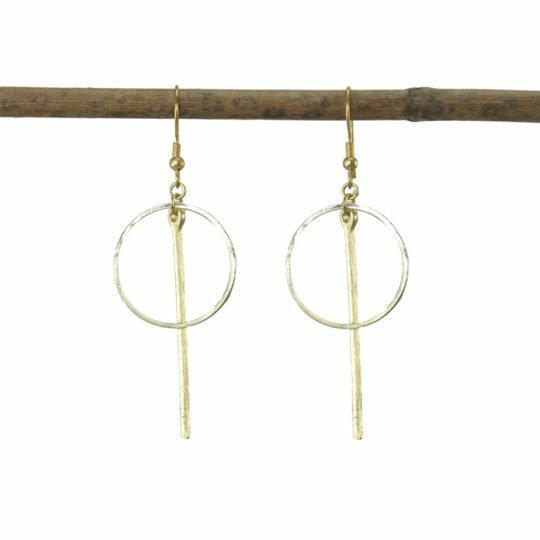 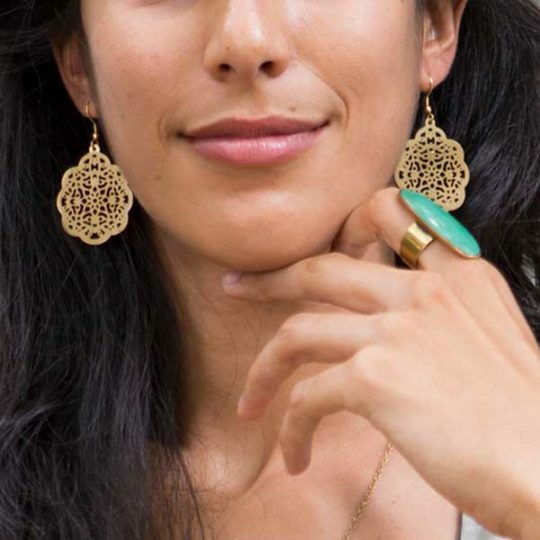 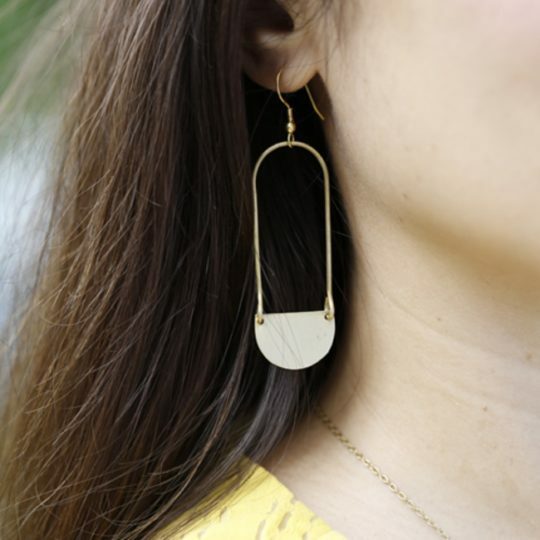 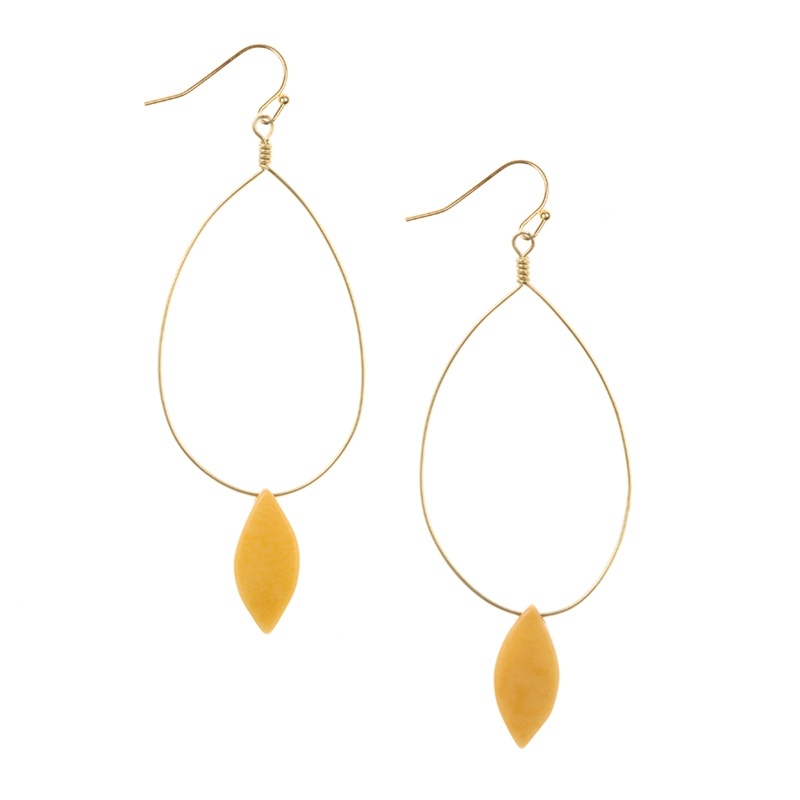 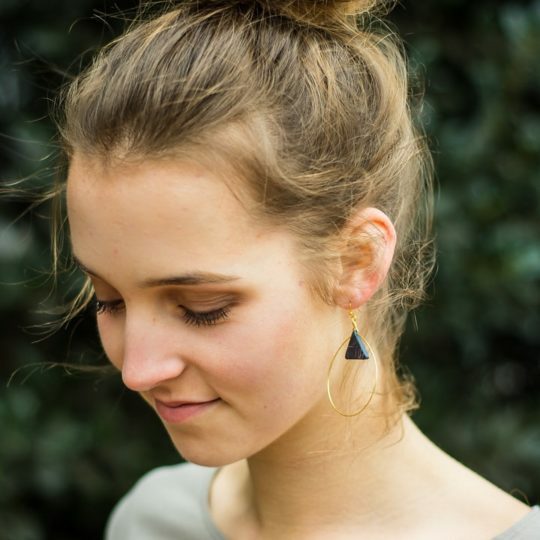 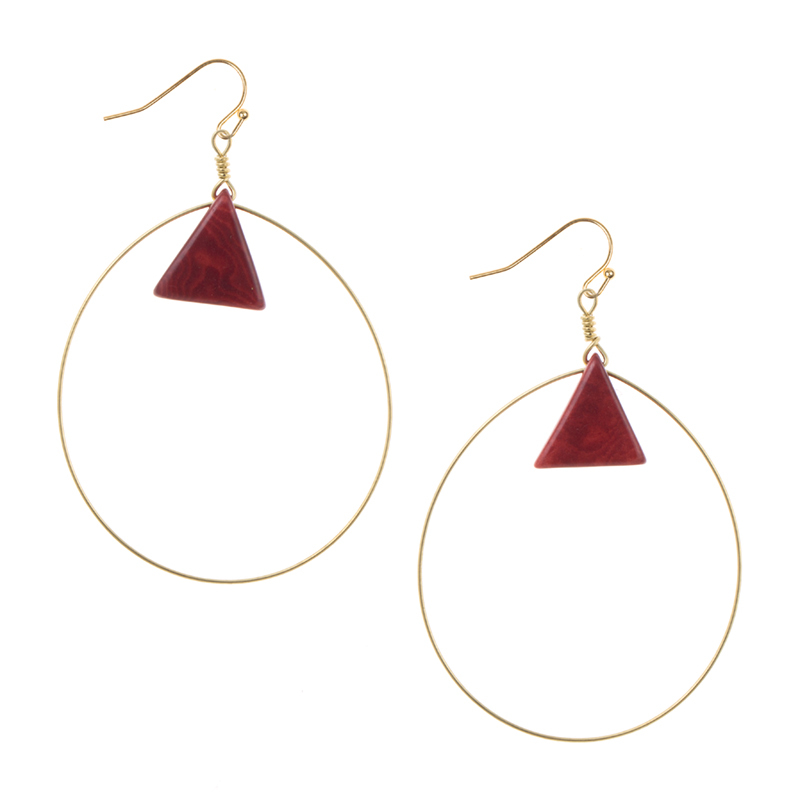 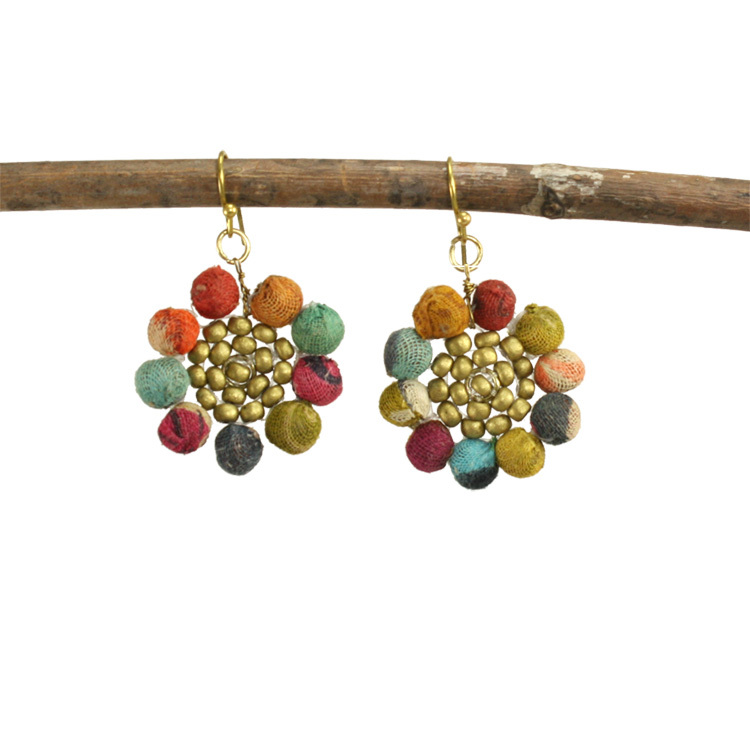 Handcrafted earrings inspired by the windows and arches of Indian architecture. 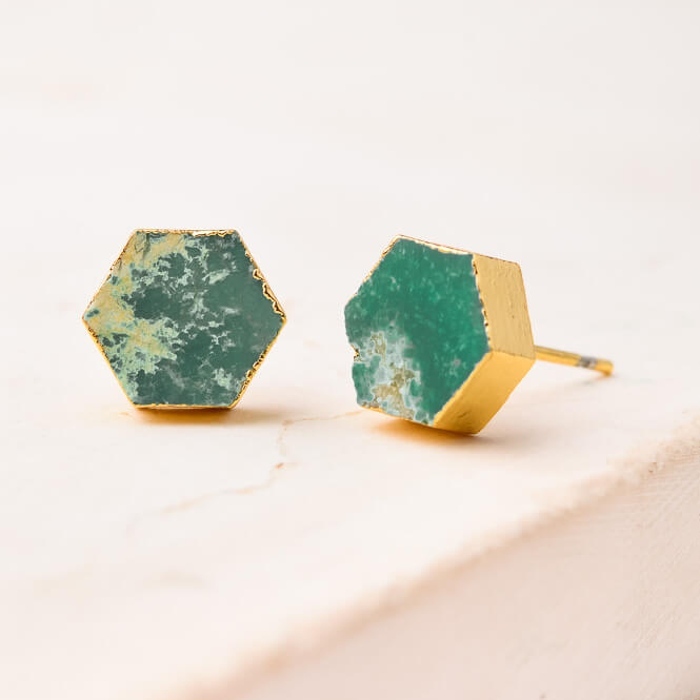 Size: 1.75" dia Material: Brass, Gold and teal patina finish **Learn more about Matr Boomie and the artisans who made this product. 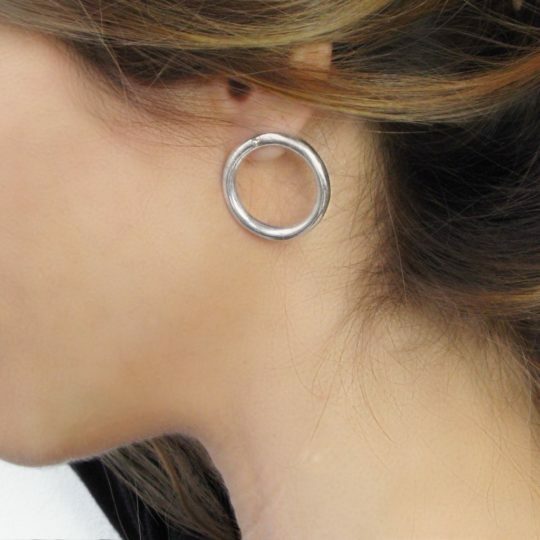 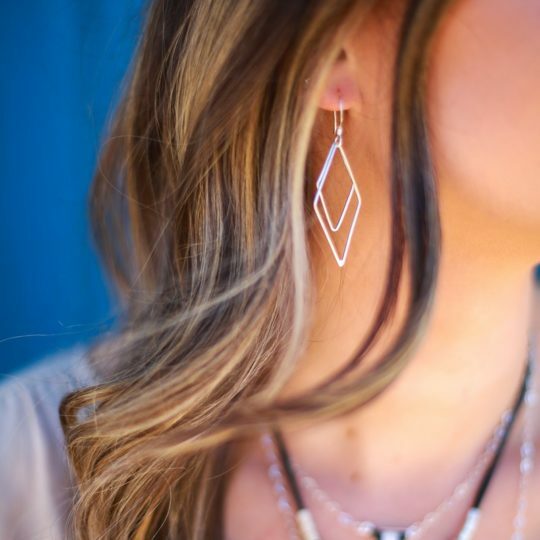 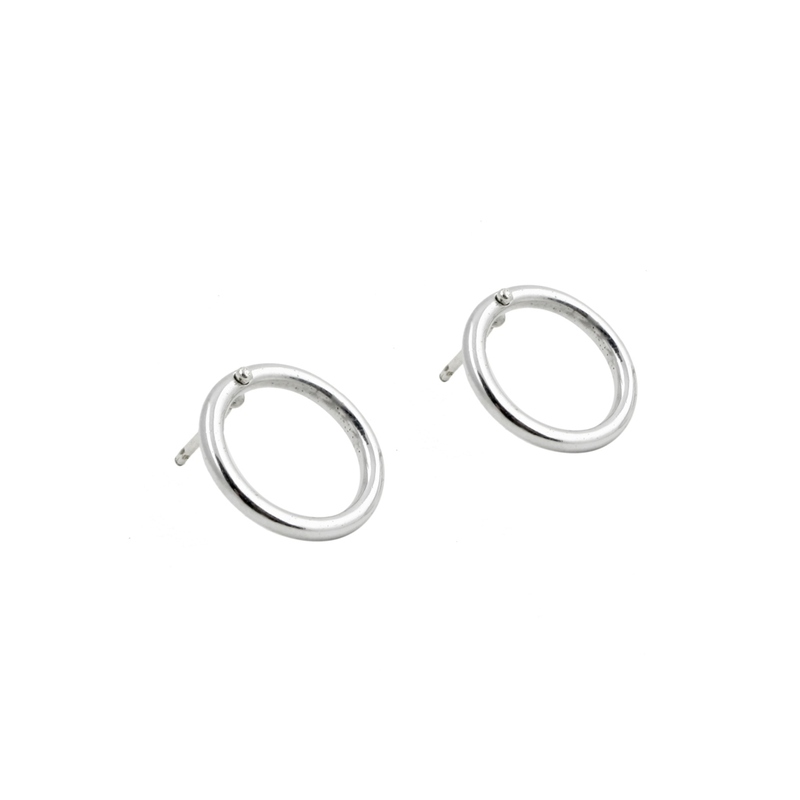 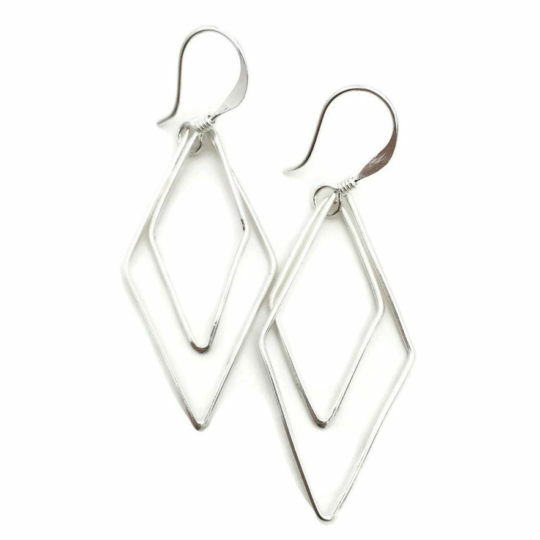 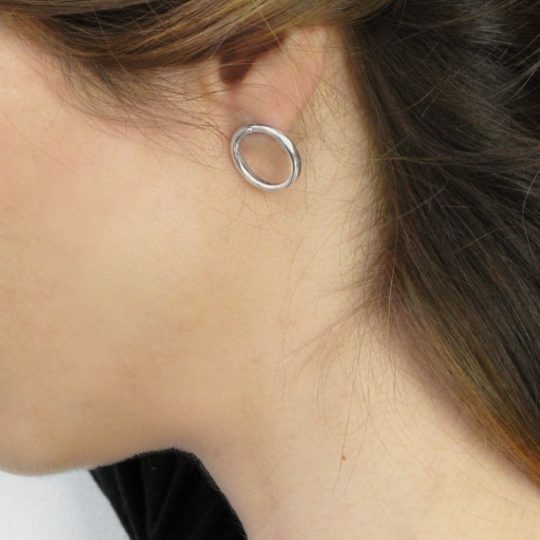 These are lightweight silver brushed metal earrings with airy, etched filigree designs. 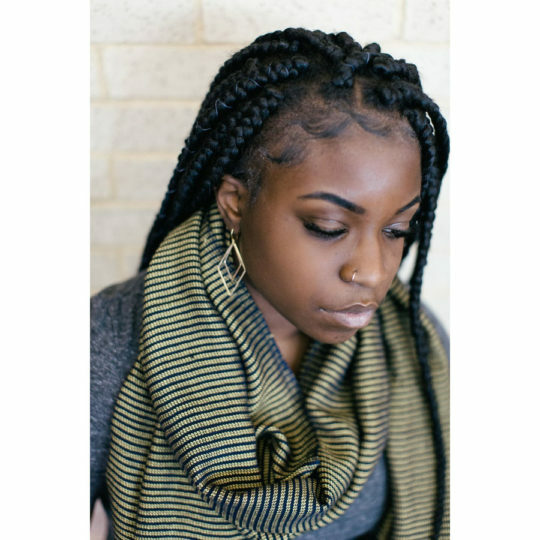 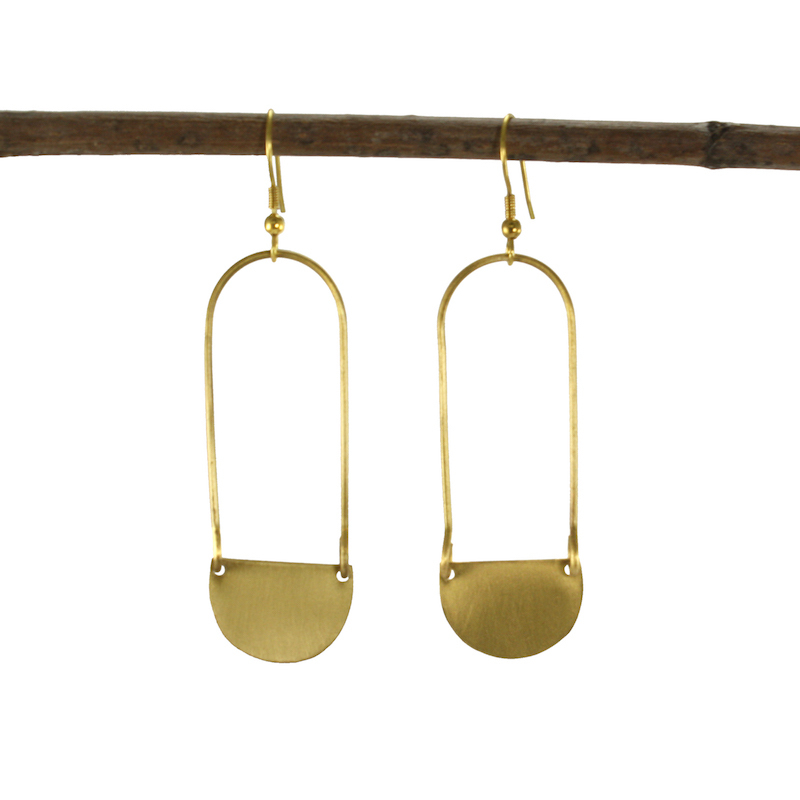 Size: 1 1/8" x 1.5" Material: Brass **Learn more about Matr Boomie and the artisans who made this product. 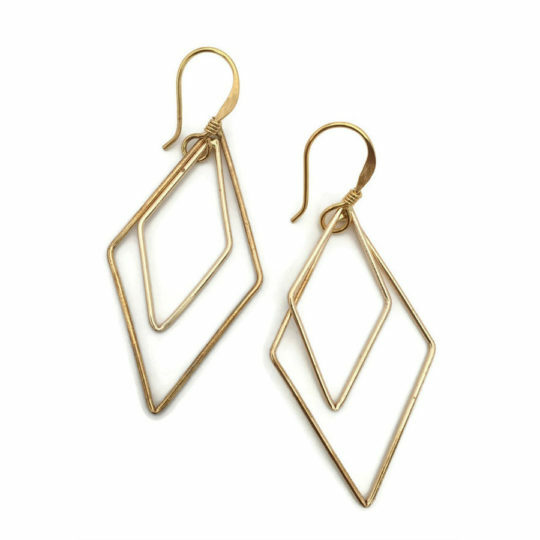 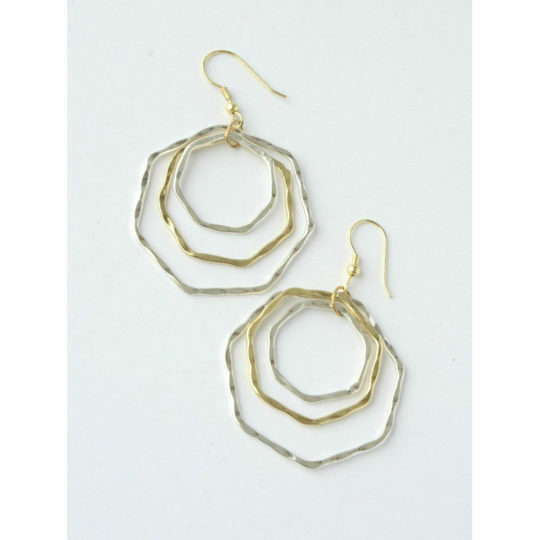 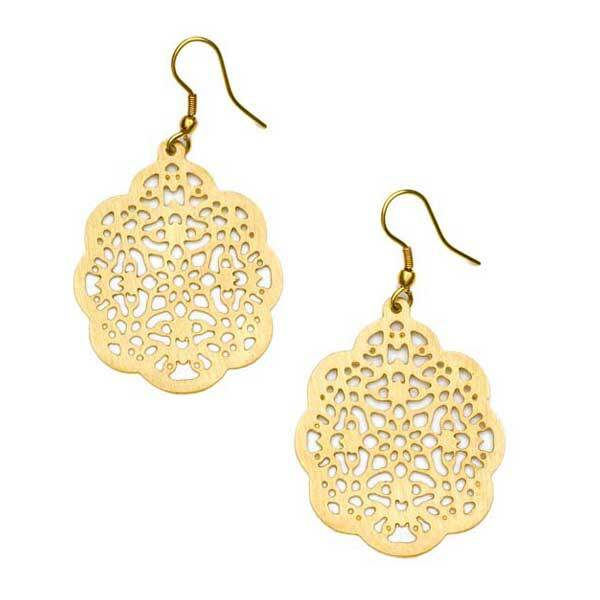 These are lightweight gold brushed metal earrings with airy, etched filigree designs. 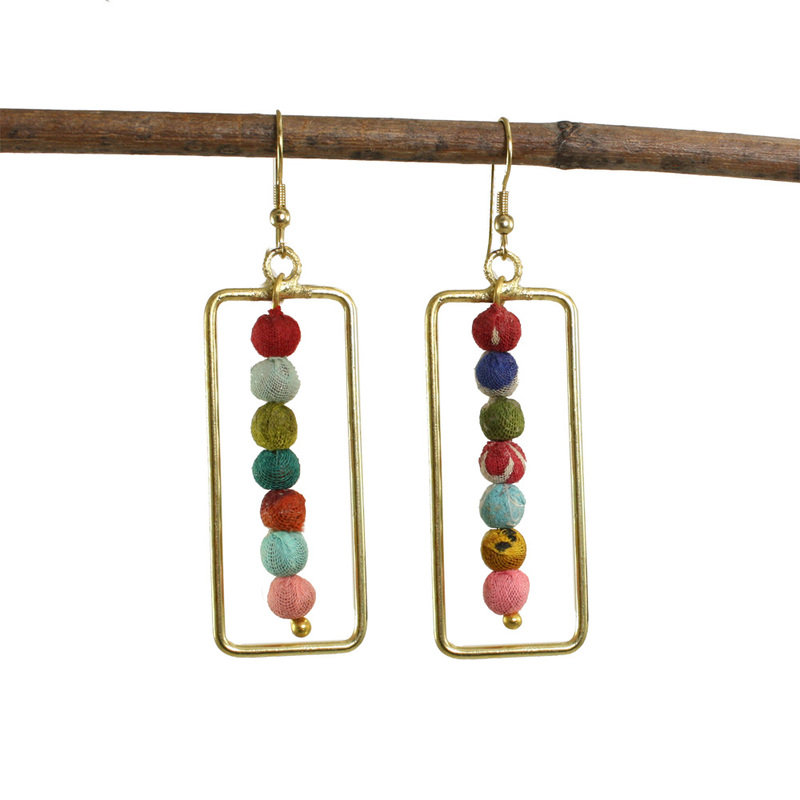 Size: 1 1/8" x 1.5" Material: Brass **Learn more about Matr Boomie and the artisans who made this product. 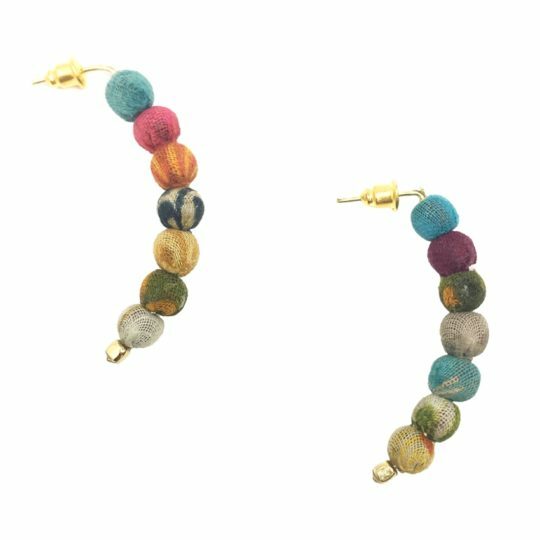 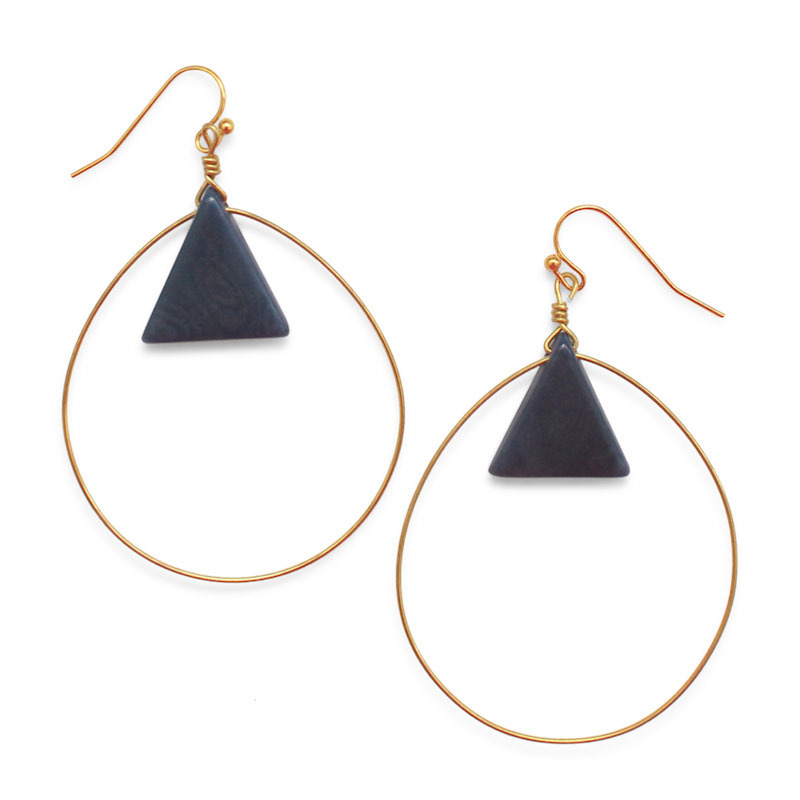 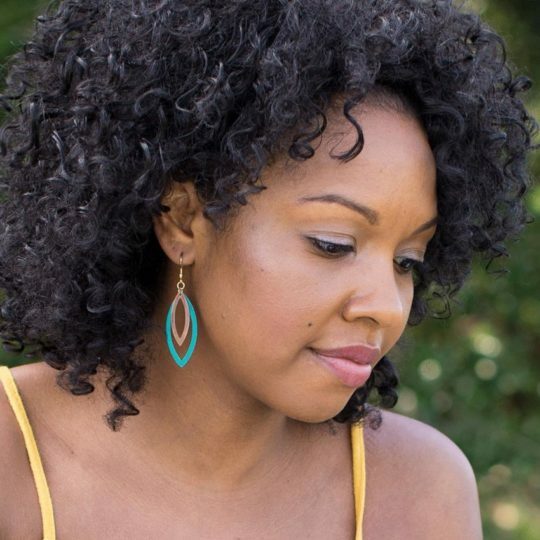 Handcrafted teal and brown patina drop earrings featuring lightweight, layered feather loop design. Size: 1.75" x 0.75" Material: Brass, teal patina finish **Learn more about Matr Boomie and the artisans who made this product. 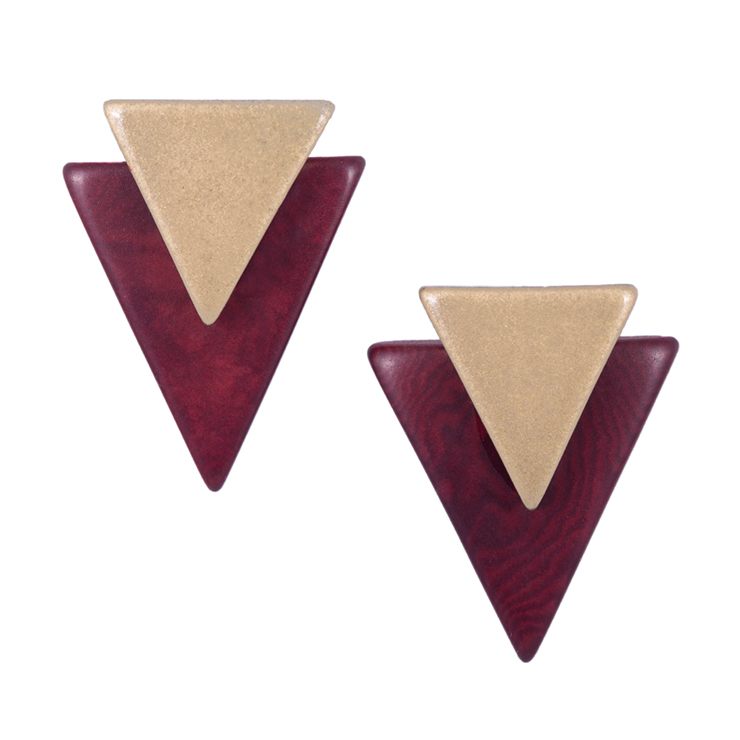 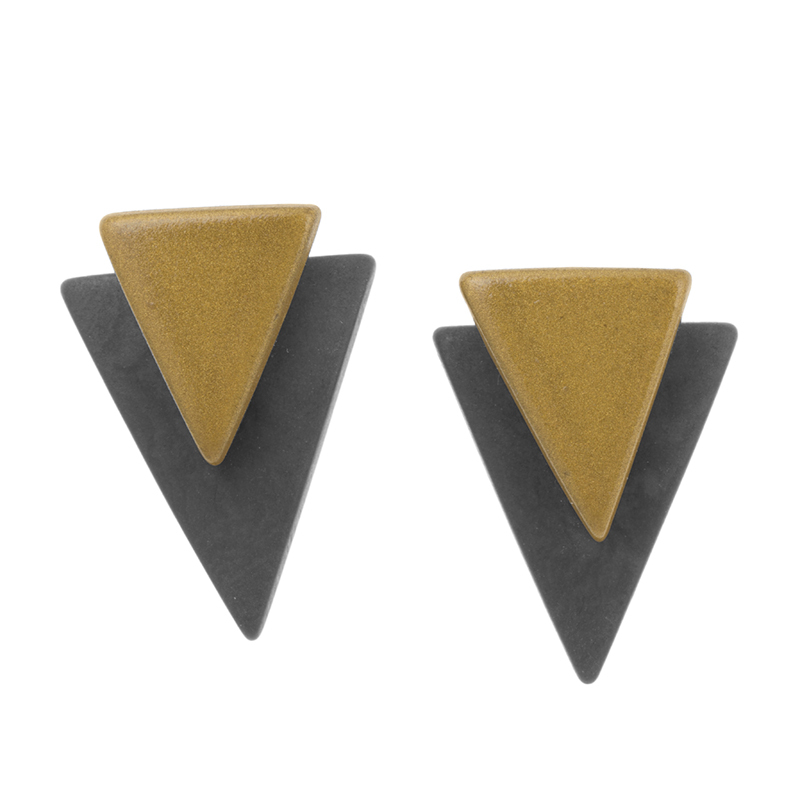 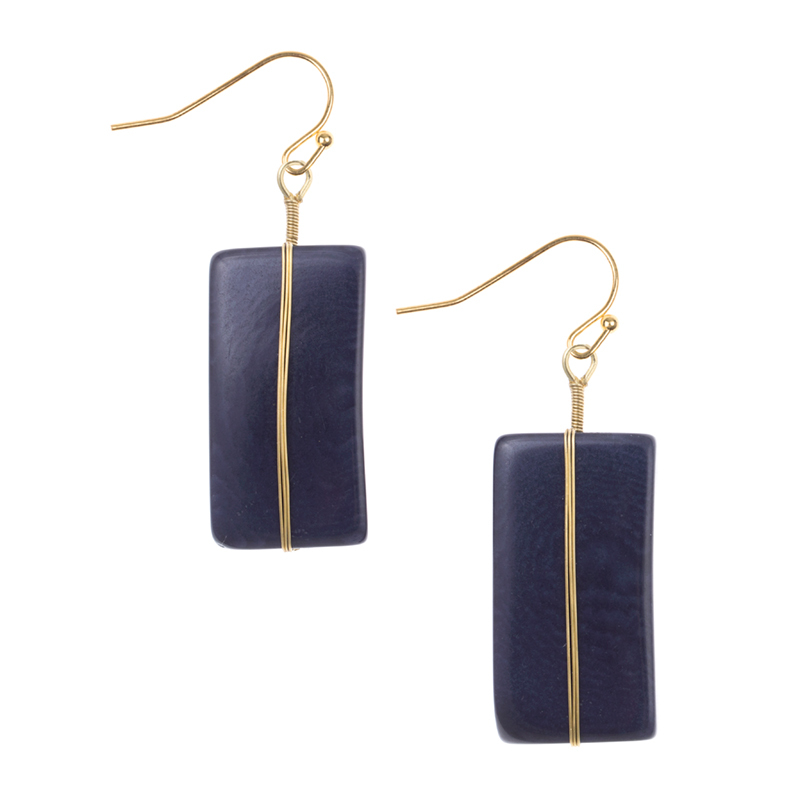 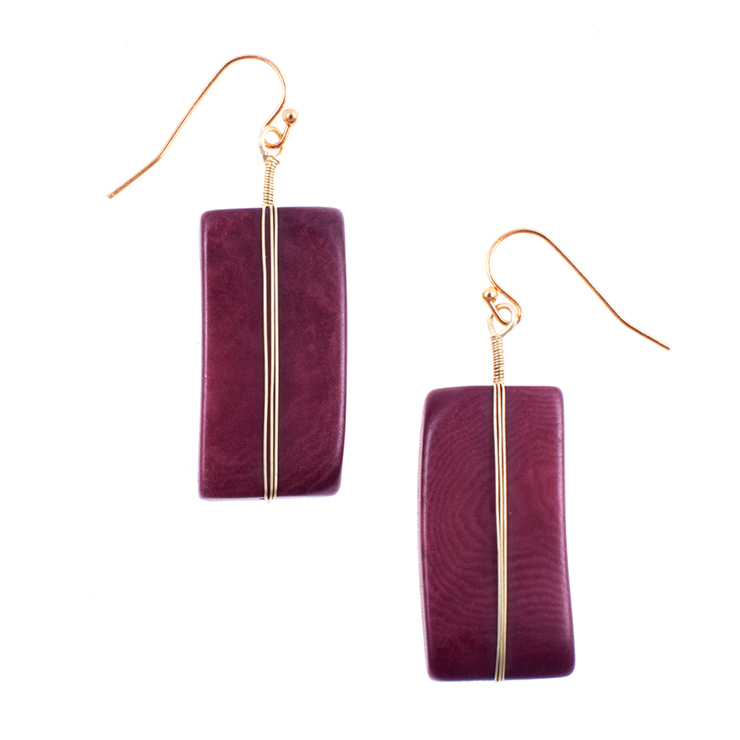 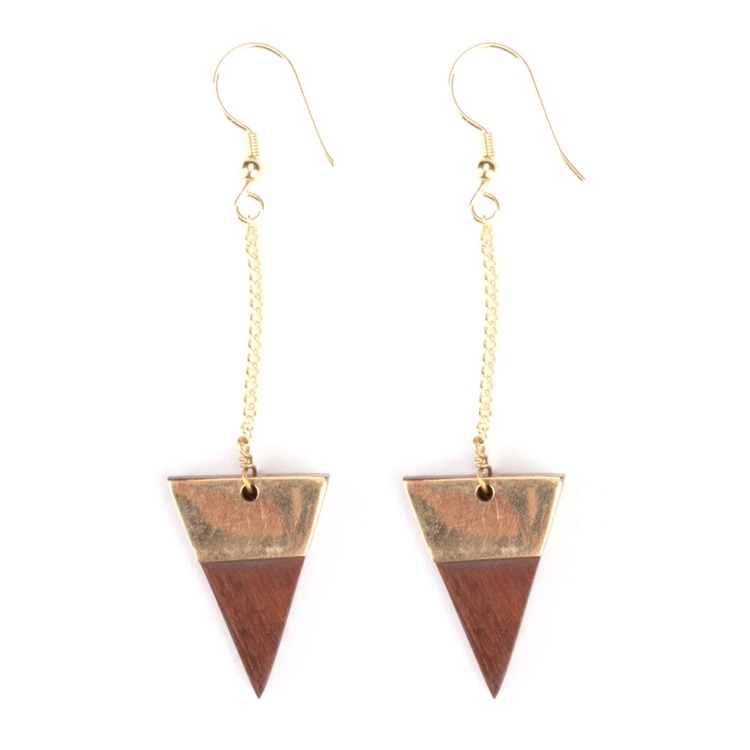 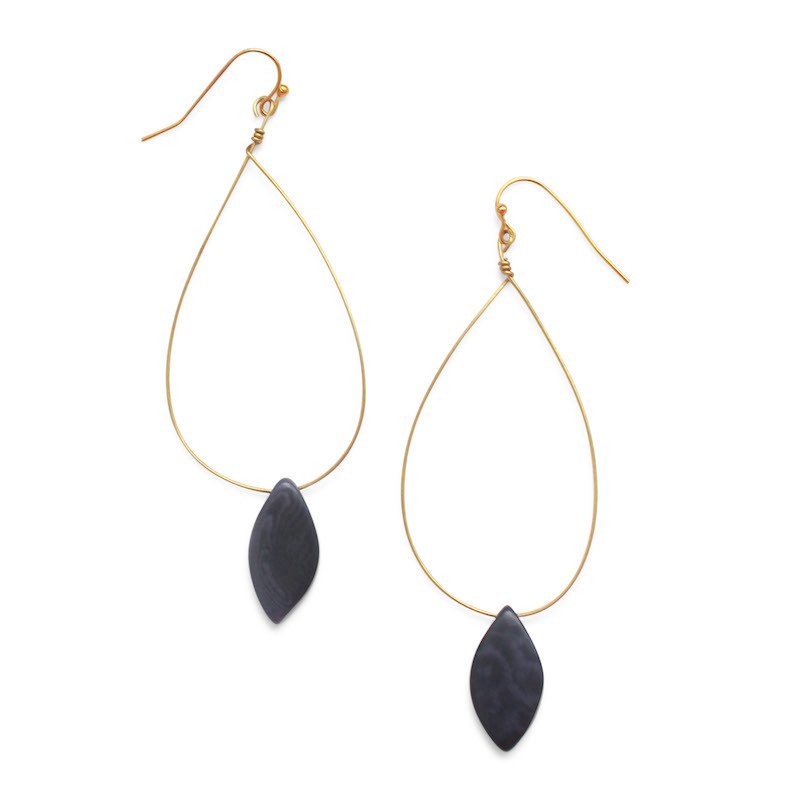 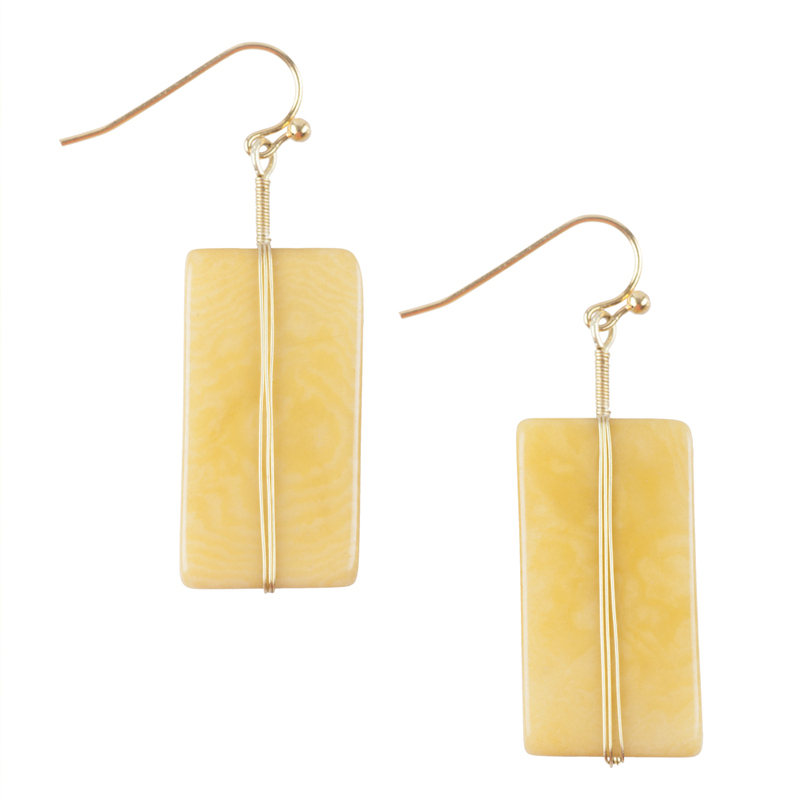 These metal earrings are comprised of two-layers and are embossed from a leaf. 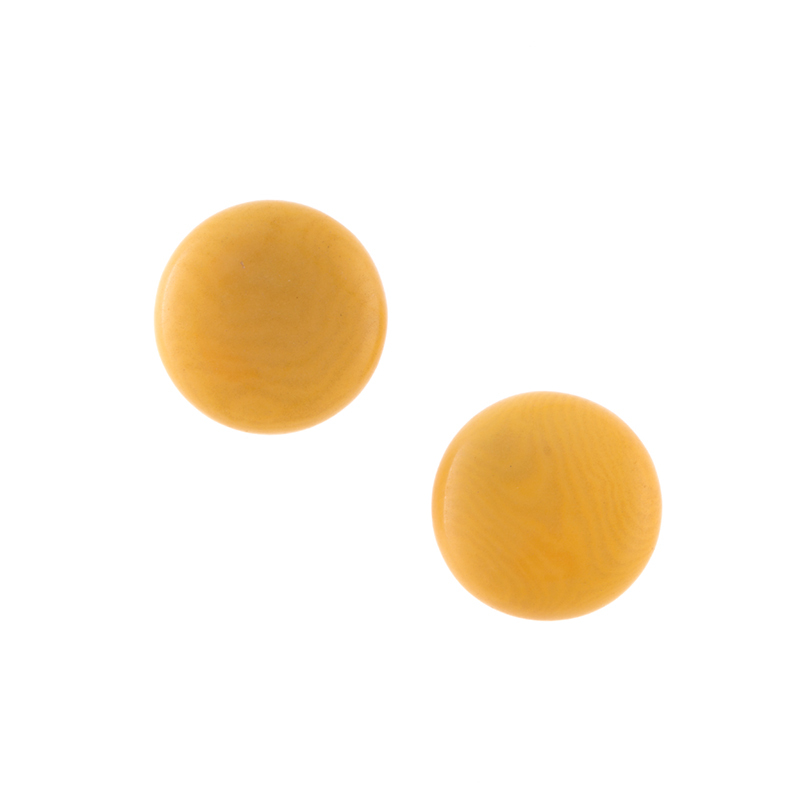 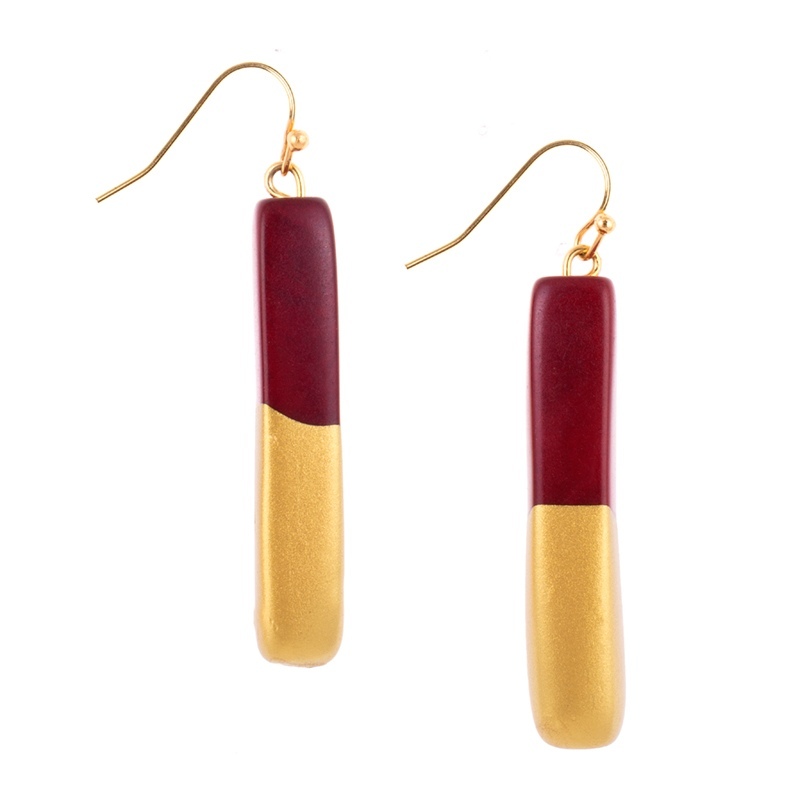 Size: 0.7" L, 1.5" W Material: Brass **Learn more about Matr Boomie and the artisans who made this product. 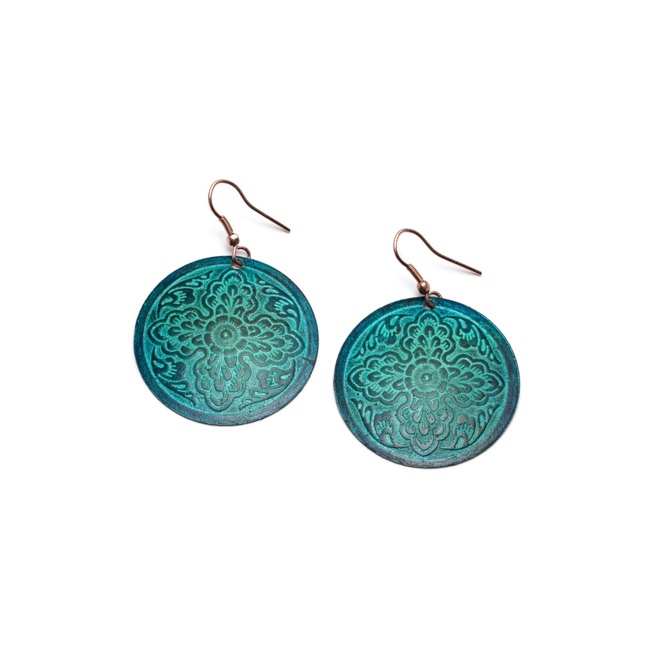 Handcrafted multi-metal earrings in copper and teal vintage floral design. 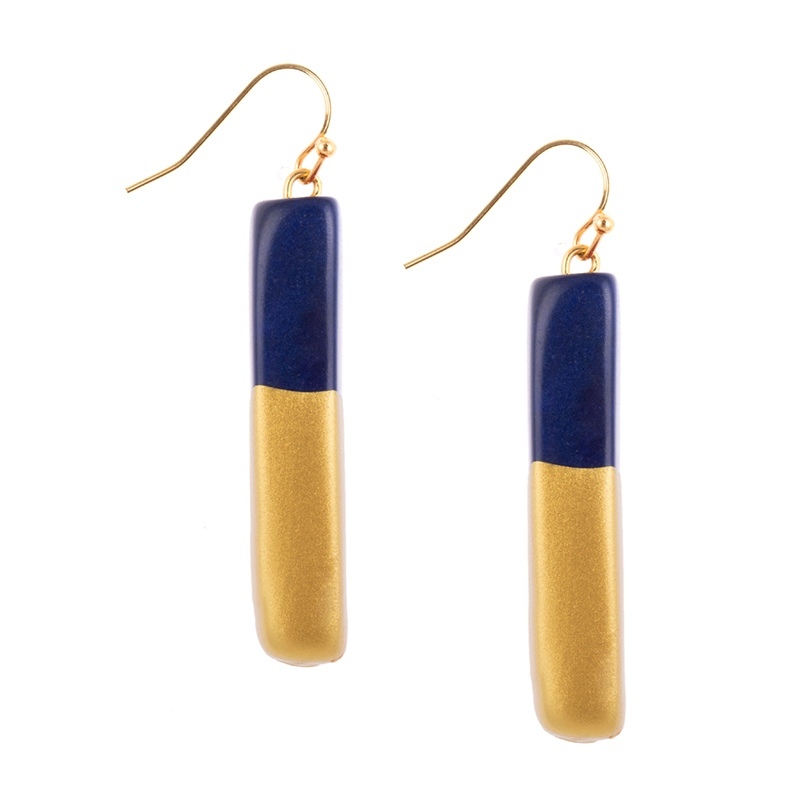 Size: 1.5" dia Material: Brass **Learn more about Matr Boomie and the artisans who made this product. 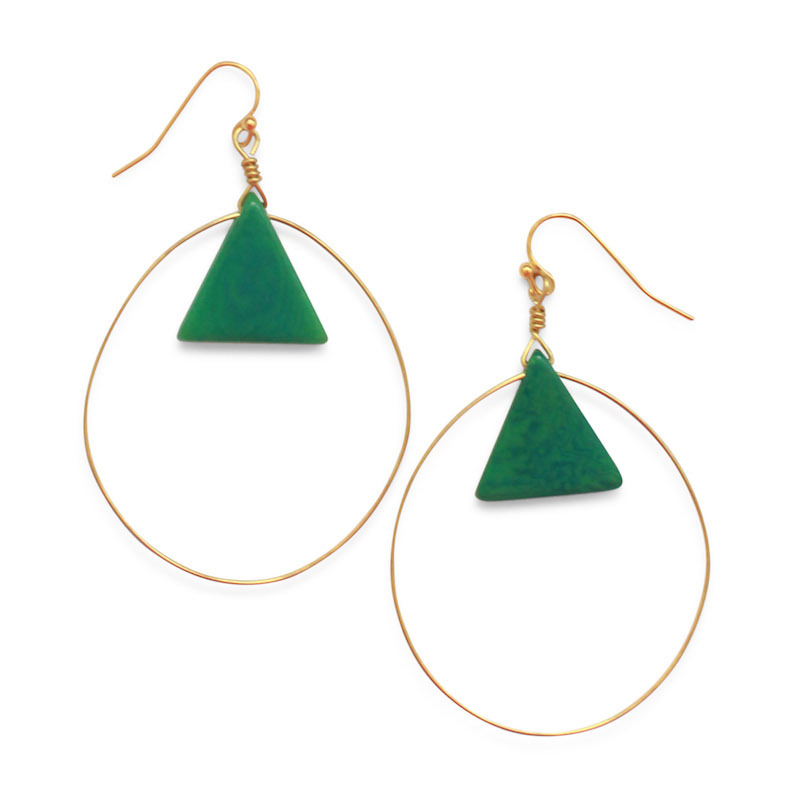 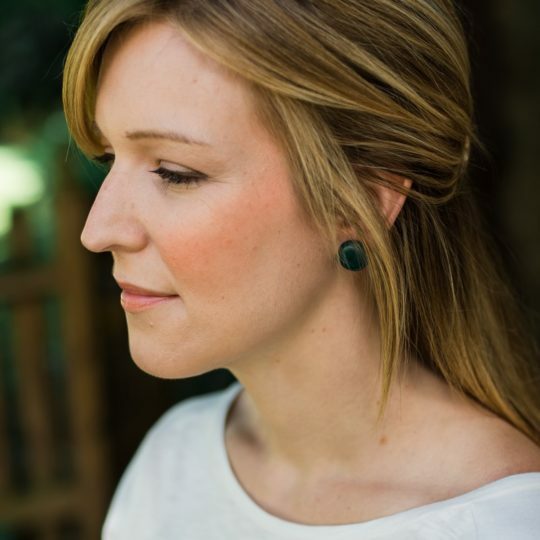 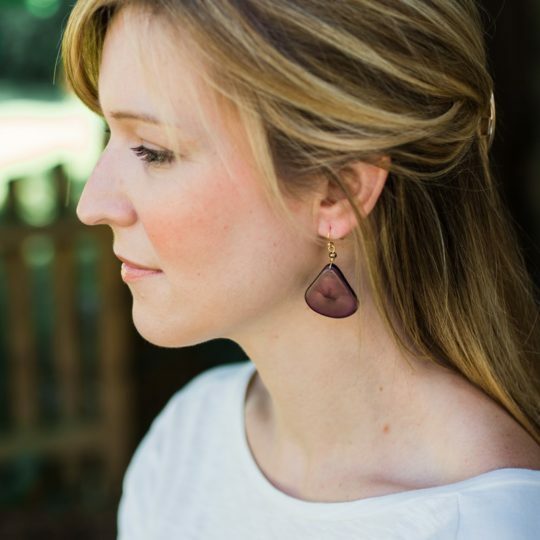 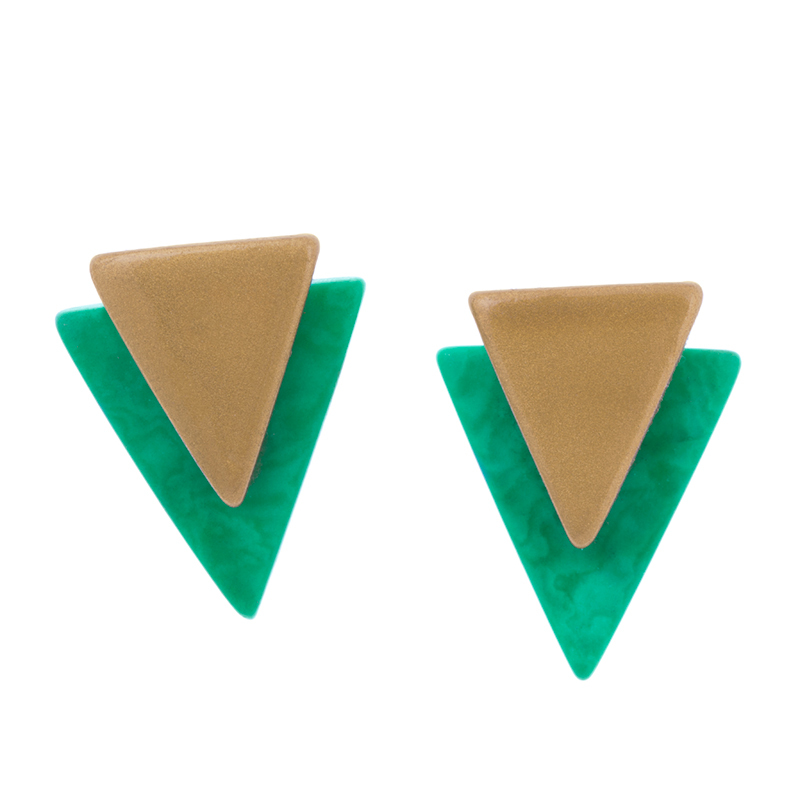 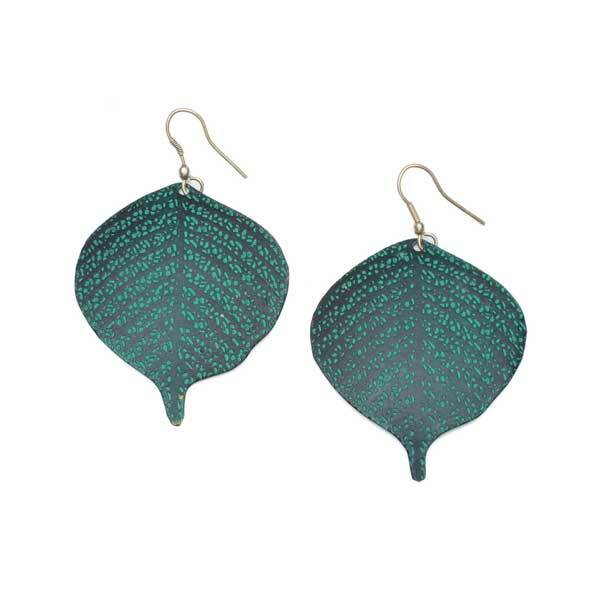 Bold, lightweight earrings with etched bodhi leaf design and teal patina finish. 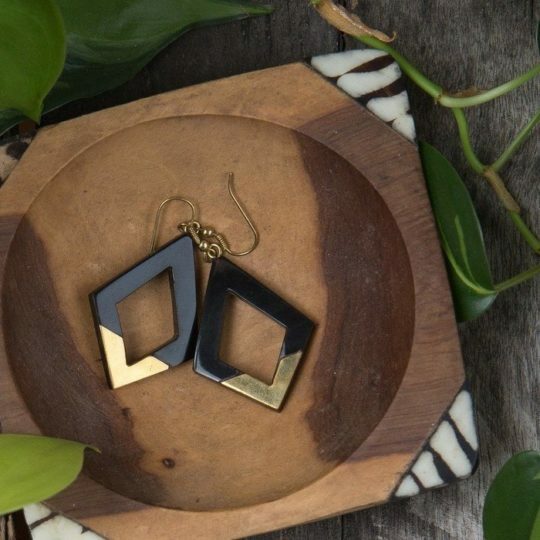 Size: 1 5/8" x 2" Material: Brass **Learn more about Matr Boomie and the artisans who made this product. 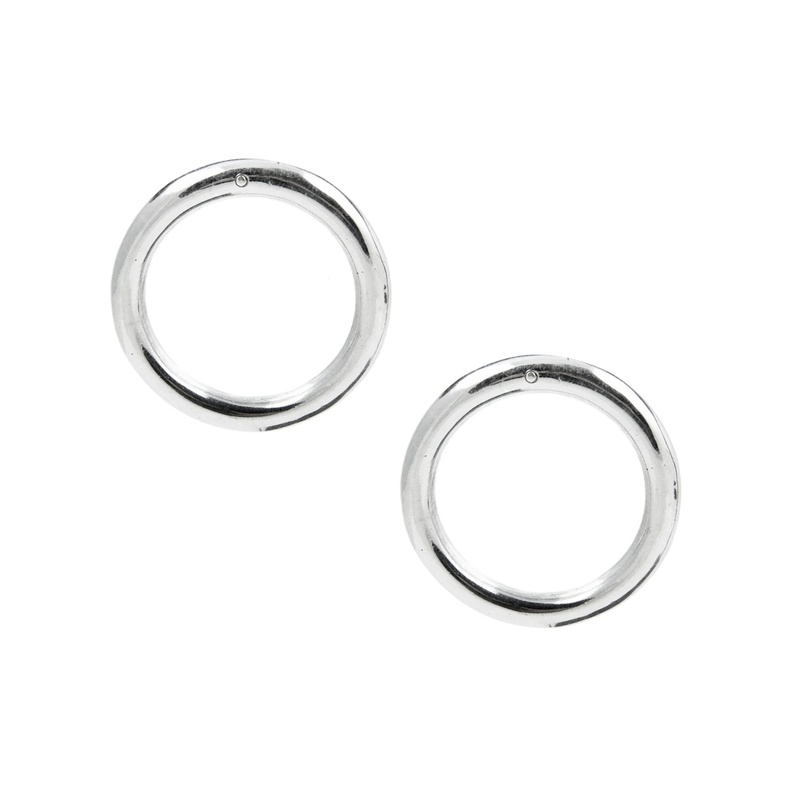 These lightweight earrings feature etched floral patterns in silver finish. 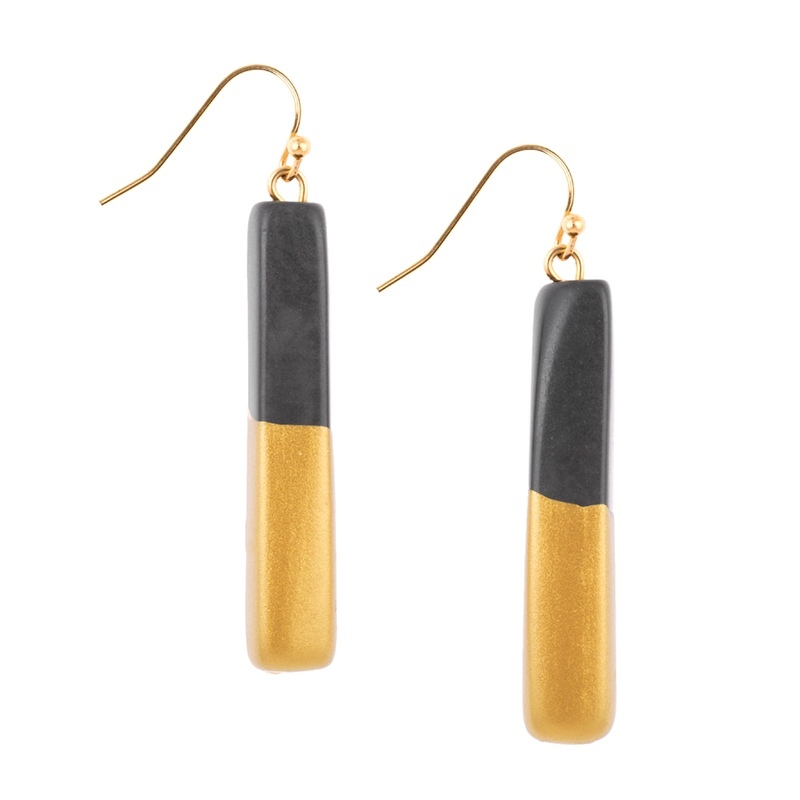 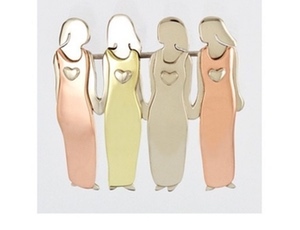 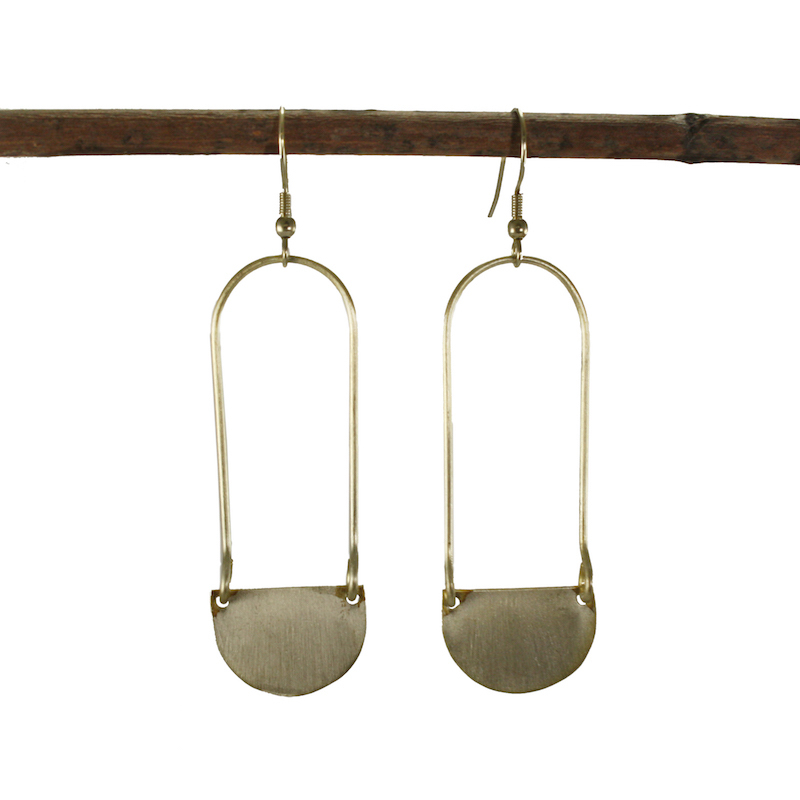 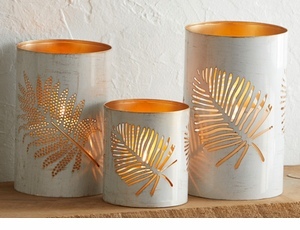 Size: 2"L Material: Brass **Learn more about Matr Boomie and the artisans who made this product. 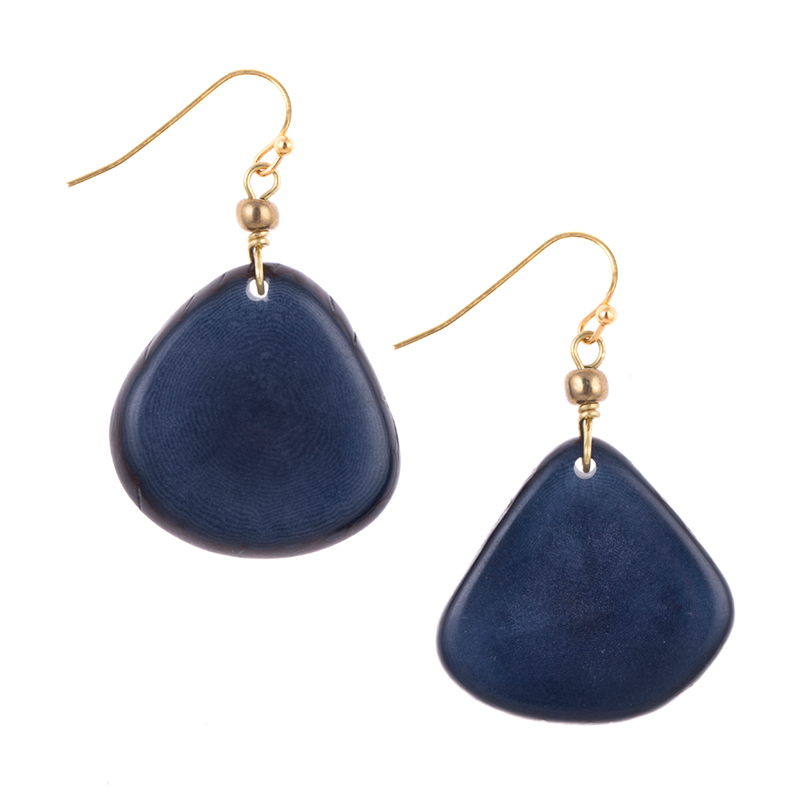 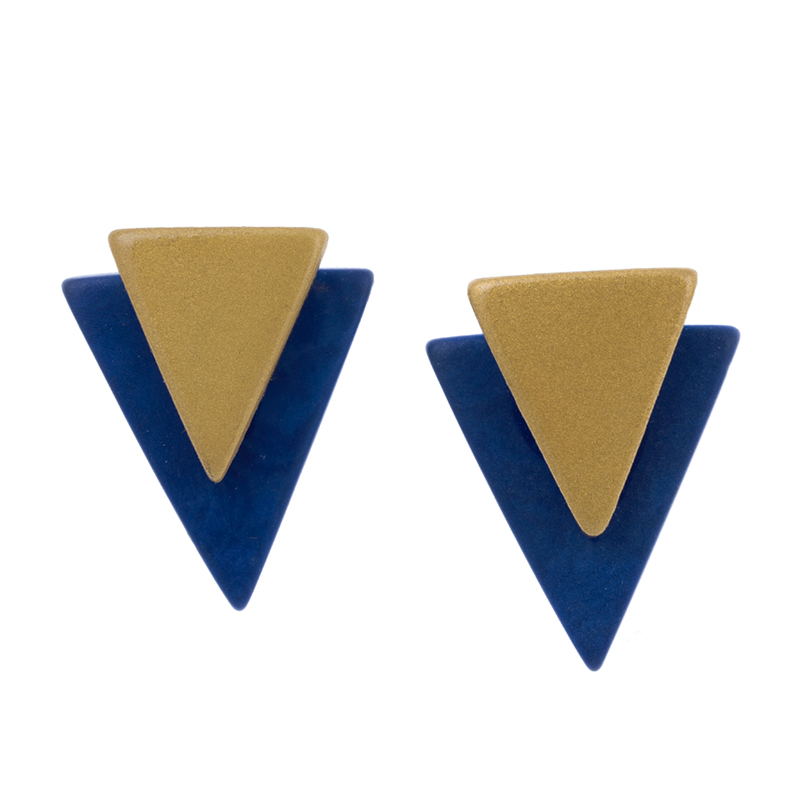 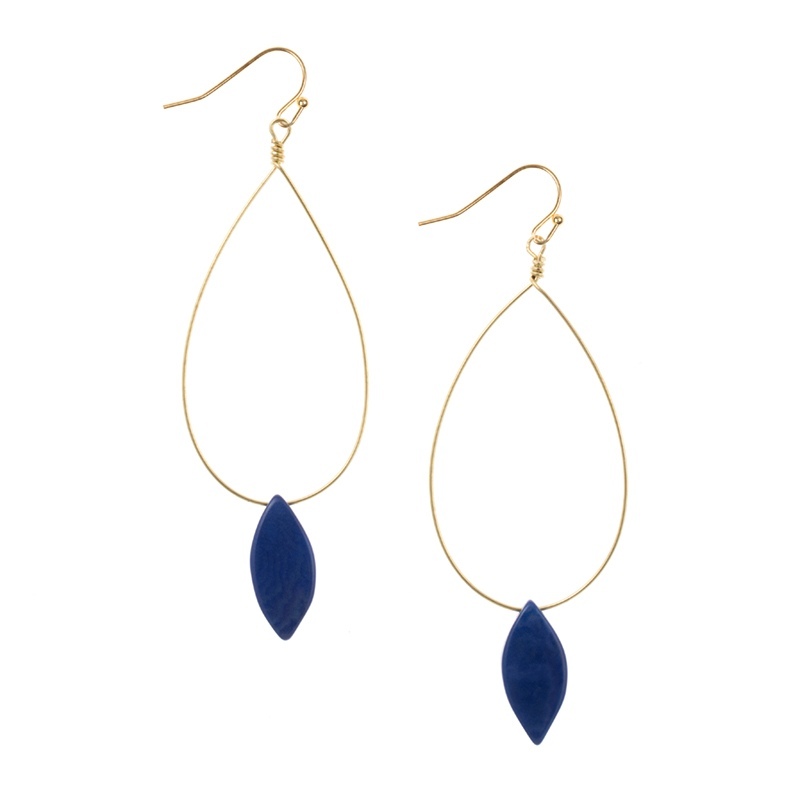 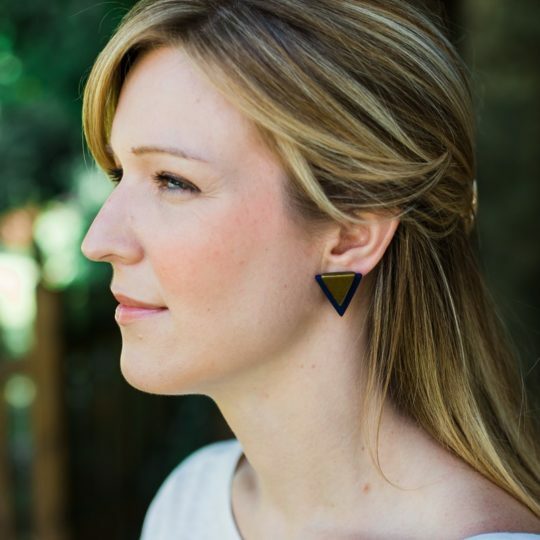 Inspired by the glamour of Gatsby, these Art Deco earrings have a scalloped design in dark blue and gold. 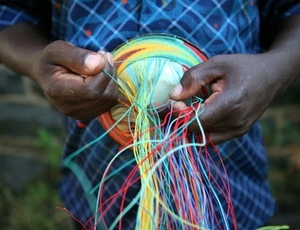 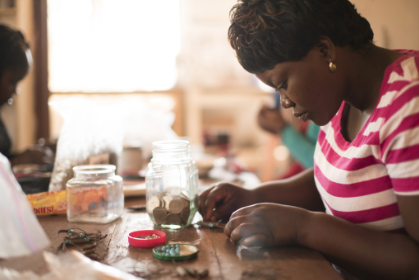 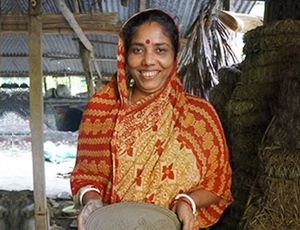 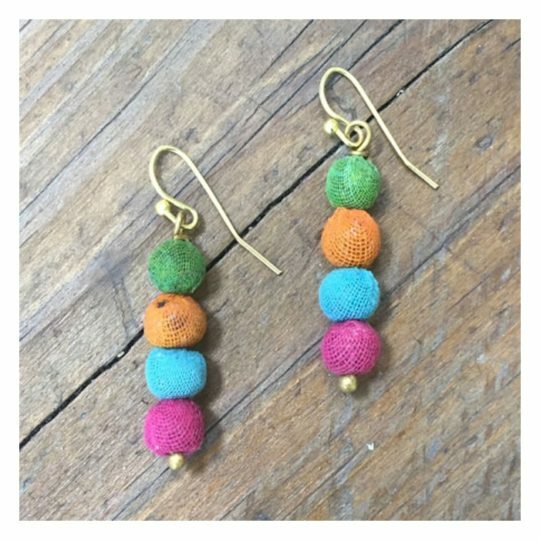 Size: 0.75" x 1.25" **Learn more about Matr Boomie and the artisans who made this product. 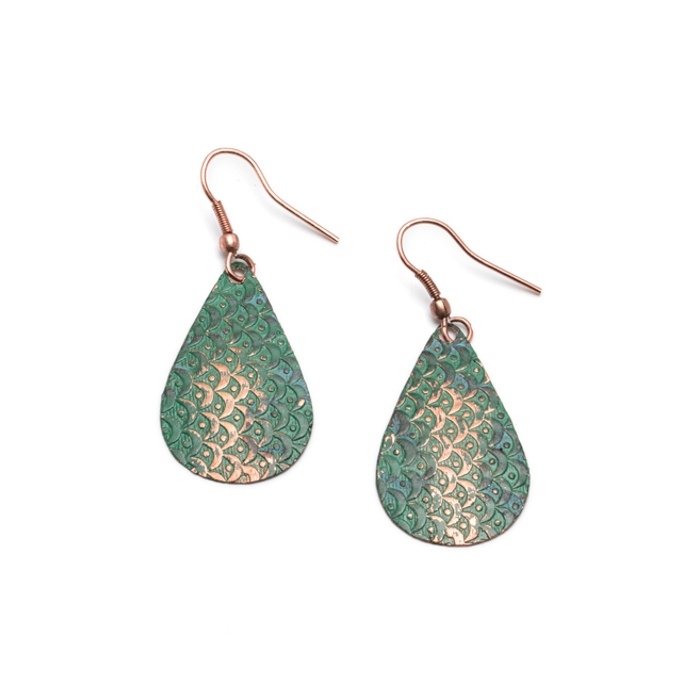 These bold earrings have a floral vine design with a copper and dark teal patina, evoking the look of an ancient Indian garden. 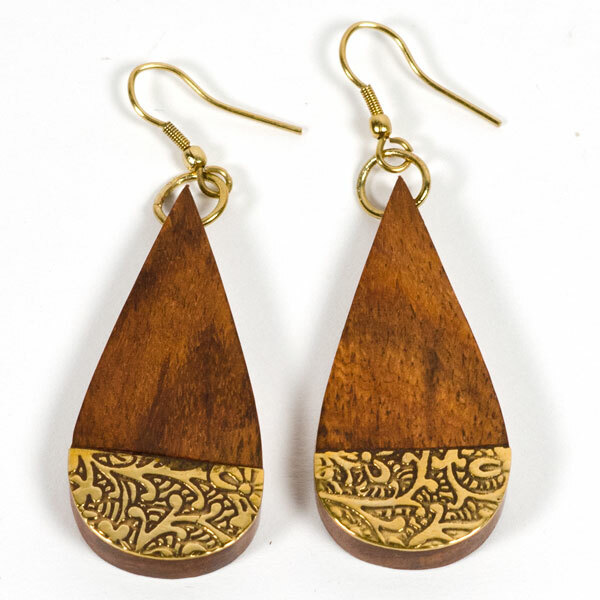 Size: 1.75" x 1.75" Material: brass **Learn more about Matr Boomie and the artisans who made this product. 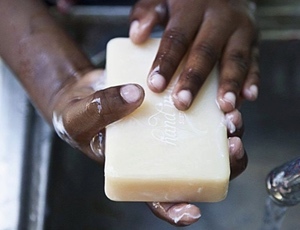 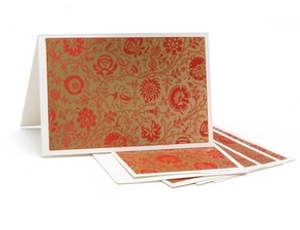 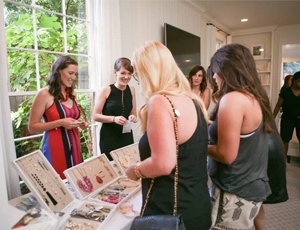 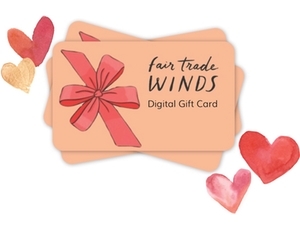 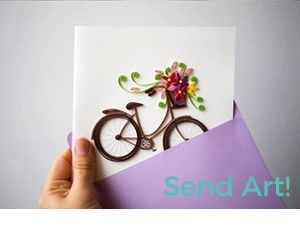 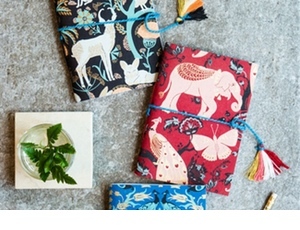 The perfect gift that gives back (even if you’re just buying a gift for yourself!) 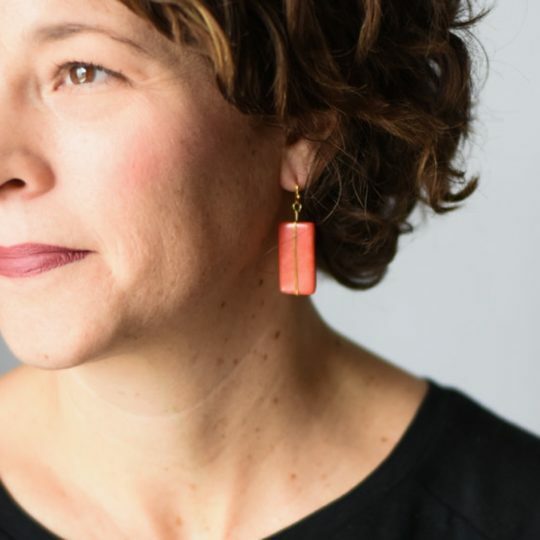 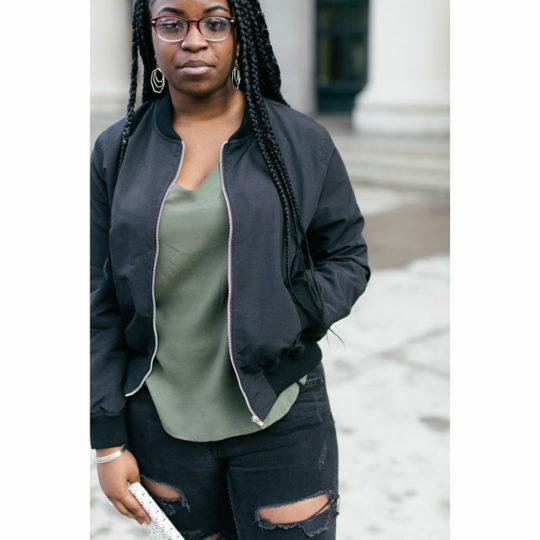 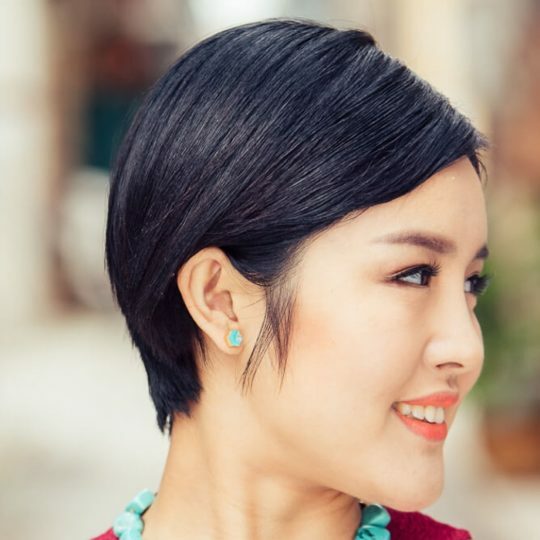 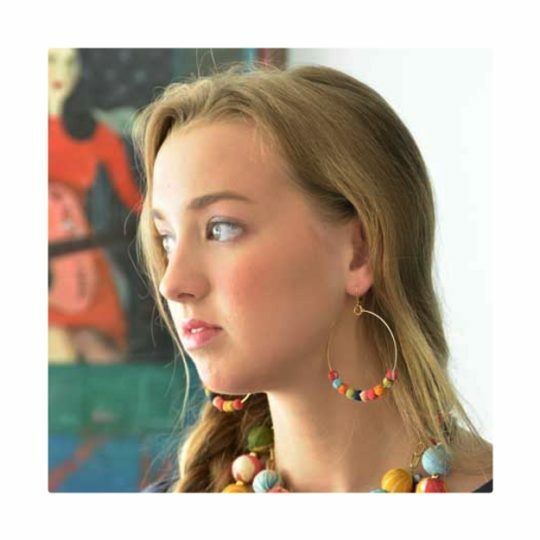 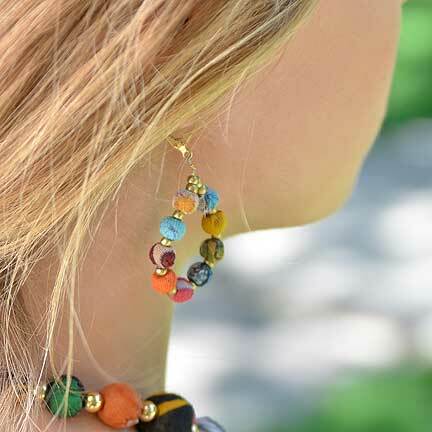 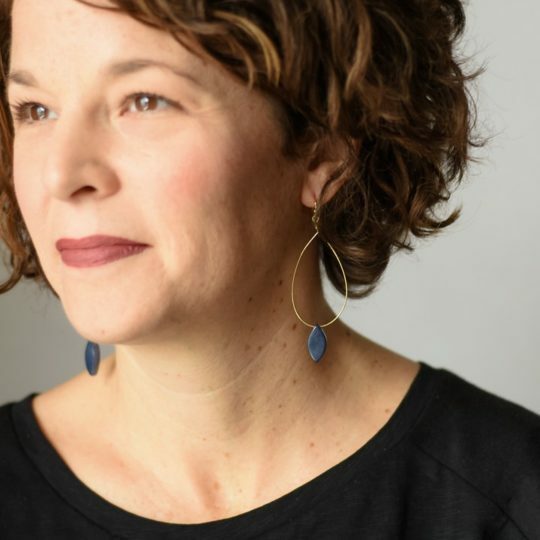 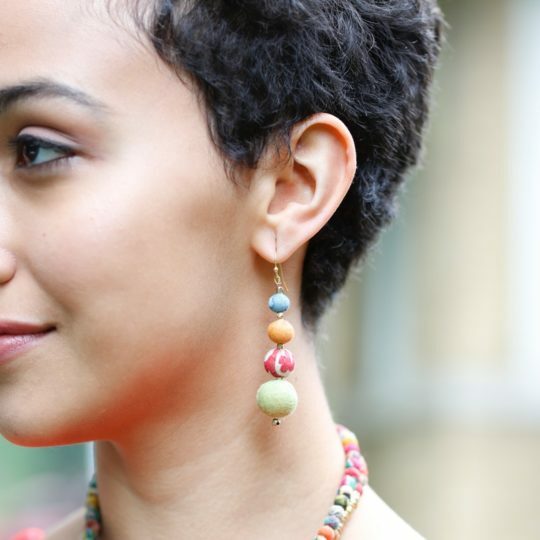 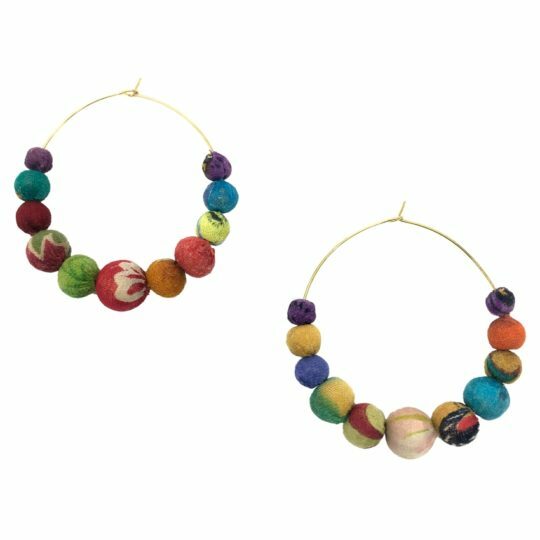 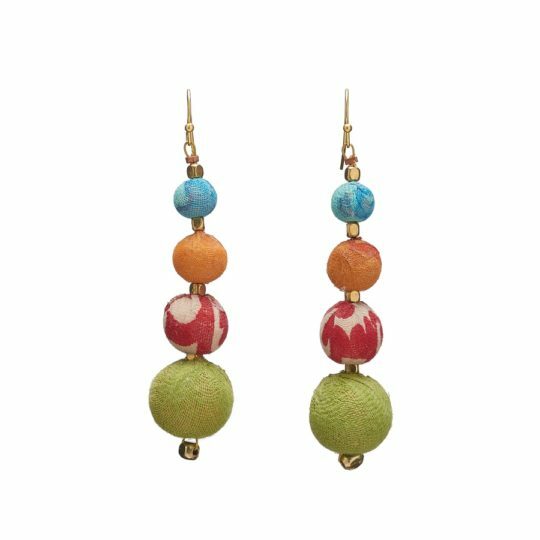 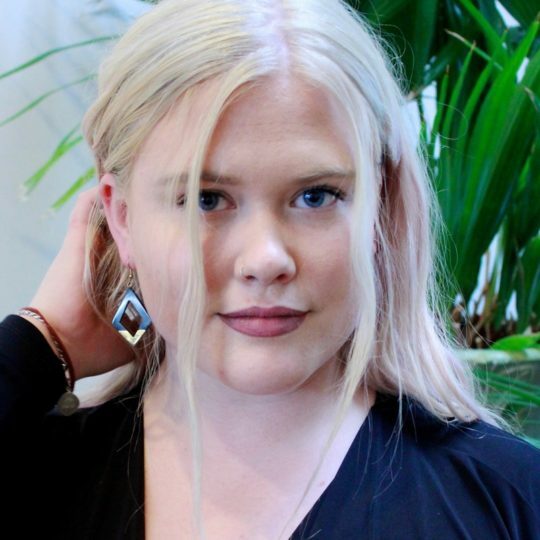 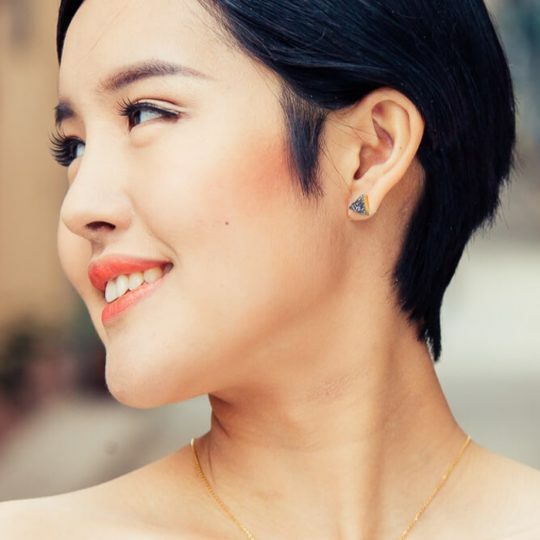 Lots of fashionable designs including beaded hoop earrings, nature-inspired silver earrings, eco-friendly tagua earrings and pearl earrings – all handmade and nickel-free.